Any thing and every thing ever asked about how to do an EJ conversion to an L series and MY. Includes Brumby and Coupe. Thought I'd start sharing the build thread for my latest project. First, some background on me; I am an engineer, with 25+ years experience in the conversion scene, and enjoy doing the unusual conversions that most people don't attempt. All of my conversions are fully complied through RTA/RMS signatories, and I do as much as possible of the work myself, including the machining, welding and fabrication. Most of my conversions are still on the road, and it's pretty satisfying to see them pop up at car shows, or just spotted randomly. 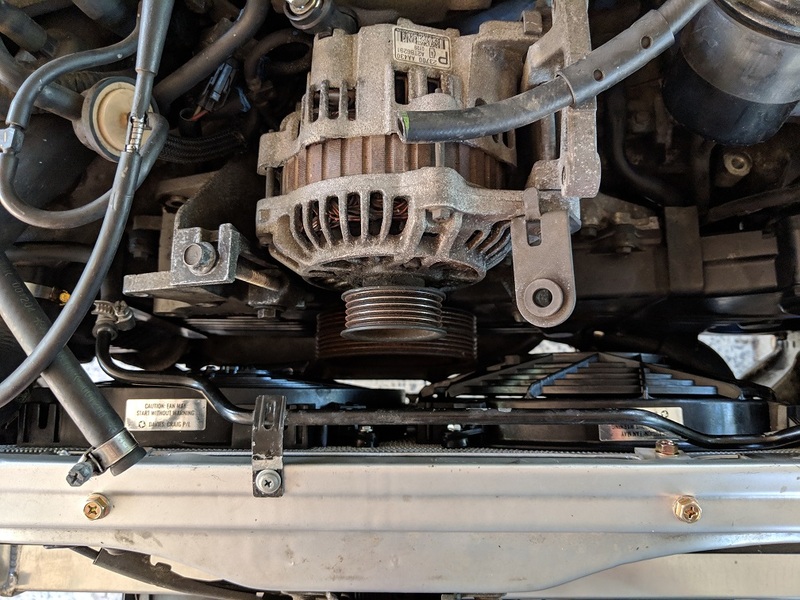 Where possible, I use off-the-shelf parts, which keeps costs down, and ensures that the vehicle can be serviced/repaired well into the future. None of my vehicles are built to be show cars. They are all designed to be reliable, daily drives, that don't draw attention to the owner; classic sleepers. Vehicle; 1992 L-Series EA83 wagon, with a 3 speed auto. Donor; 2001 Bug-eye WRX, manual. First project; Rear disc conversion. As many of you know, the L-series was available with rear disc brakes, both here and in the USA. These were generally found on the turbo models, and also various Vortex vehicles. 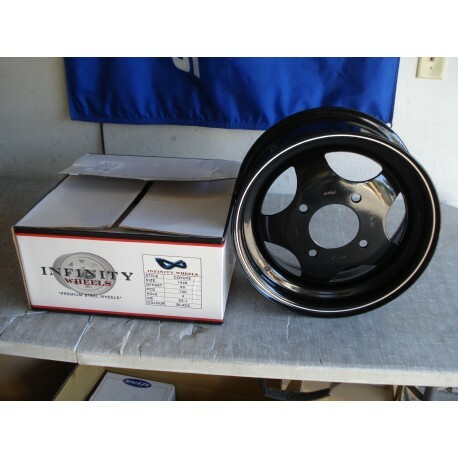 There is a difference between the hubs for AWD and FWD, and they are available in 4 x 140 and 5 x 100 PCD. The 5 x 100 PCD was fitted to the XT6 only (6 cylinder Vortex), and involved further modification to the front hubs to fit the L-Series. I wanted to keep 4 x 140, so I set about sourcing those. 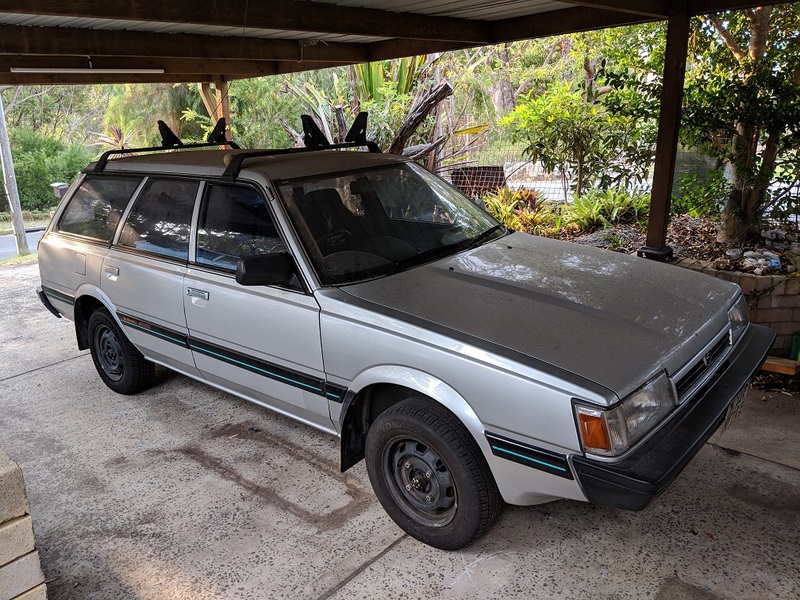 After ringing EVERY Subaru contact in Australia that I could think of, I received a few promising leads, all of which turned out to be dead ends, or just weirdos. I finally found a wrecking yard in the good old USA, that had the setup that I wanted. I had them send over the hubs, backing plates and all fasteners. The backing plates mount the rear calipers, so they are a critical part to source in good condition. Again from the USA, I bought a set of reconditioned calipers, compete with the bracket that bolts to the backing plate. The USA also provided a brand new set of NOS discs. Bendix brake pads were sourced locally. 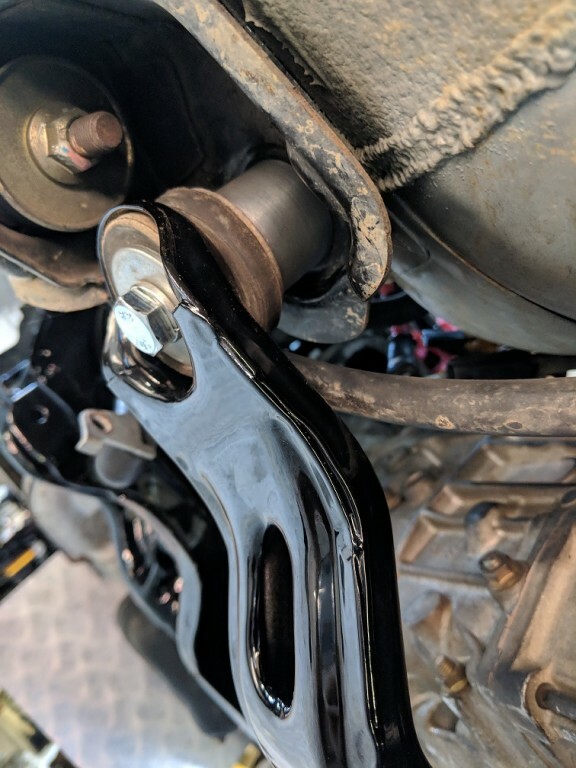 They are a direct fit, the only change required is to re-route the brake line to run over the trailing arm, below the bump stop mount. The L-Series and the WRX run virtually the same rear diff; the trusty R160. 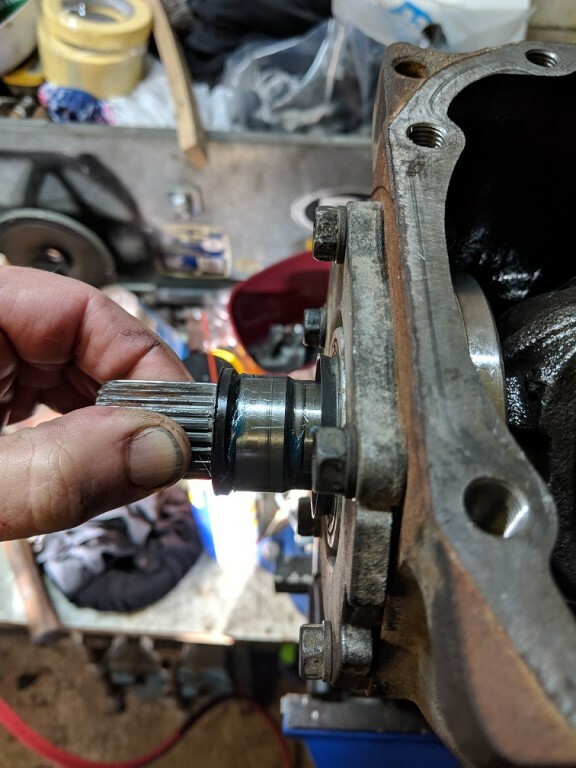 However, there are some significant differences when it comes to interchanging them, mainly the pinion flange and the external stubs fitted to the L-Series diff (the WRX has internal splines). 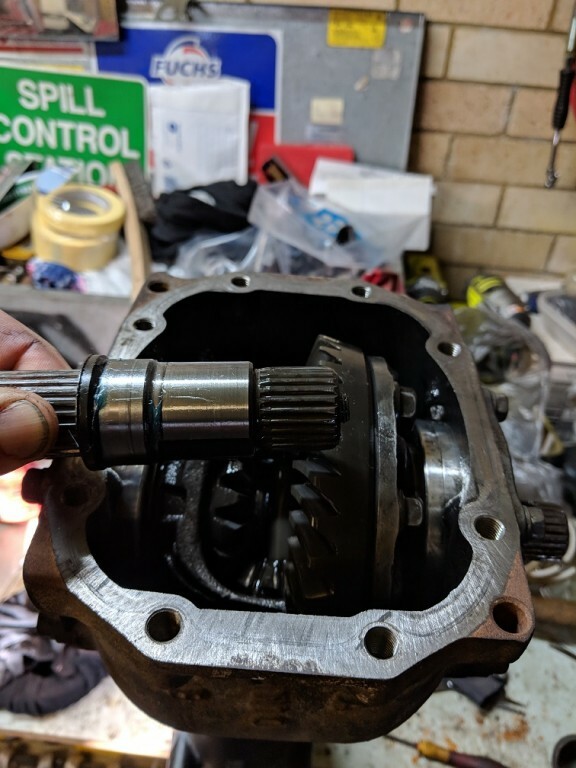 The gearbox I am running is the 3.9 version, which has a 1:1.1 output ratio to the rear diff, so although my automatic L-Series runs a 3.9, the WRX rear diff ratio is not 3.9. After careful consideration, I decided to fit the L-Series top-hat into the WRX carrier. This essentially gives me a WRX carrier and pinion, with stub axles. I can then run the L-series rear CV joints, which I have by the bucket load. Note; a T10 extended E-Torx socket is required to disassemble an L-Series diff. 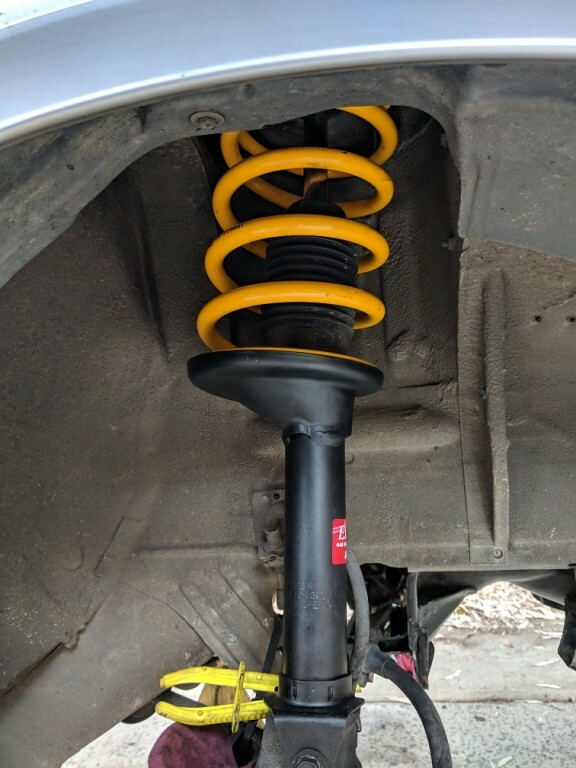 The OEM suspension in the L-Series is fairly basic. Now, I'm not building a car for track days, but I want a good daily driver. 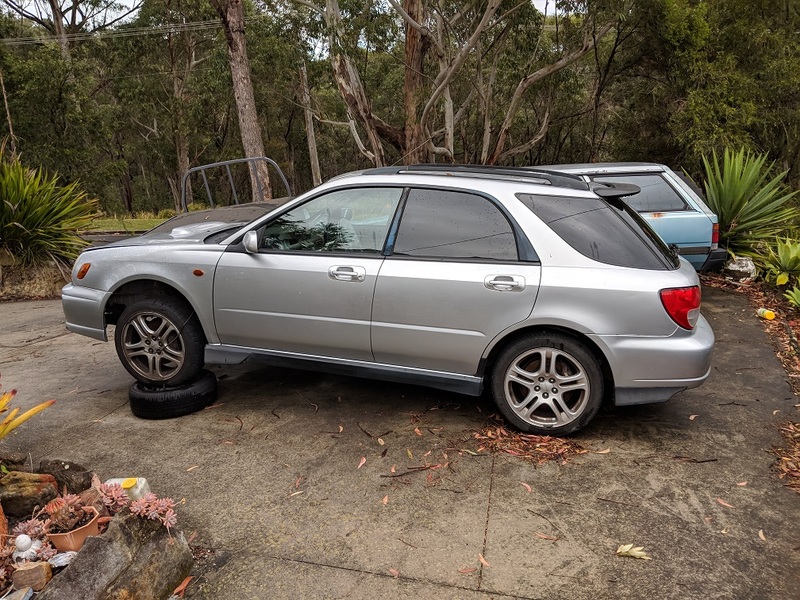 It's also important to retain stock height, as I have a goat-track driveway (as does my workplace), and I also want to run 14" tyres that match the rolling radius of the WRX. 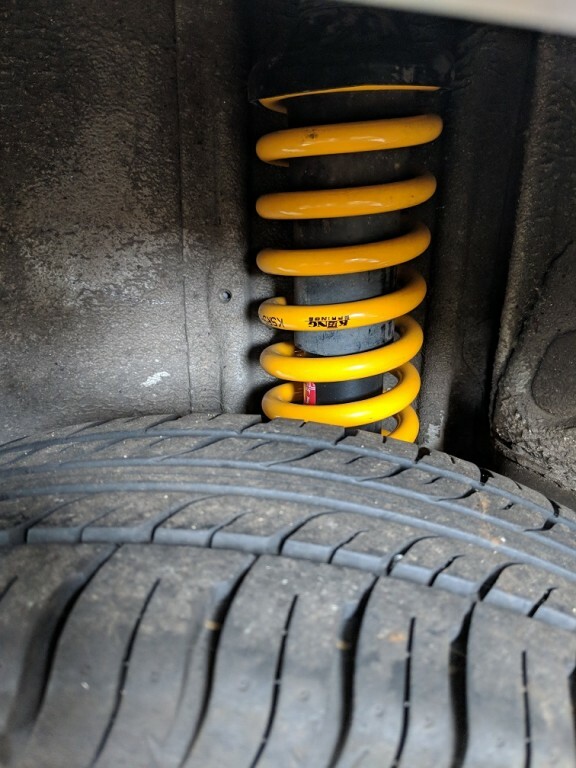 I looked at the available options, and decided on King's Springs, and KYB shocks, front and rear. I'm also looking to source a larger front sway bar, and the rear sway bar off a Turbo Wagon. This is one of the major jobs with this conversion. The original L-series runs a cable, push-type clutch, whereas the WRX runs a hydraulic pull-type clutch. My car is auto, so it's start from scratch. The WRX pedal has a spring assembly in the top pivot, which adds a significant amount of height to the pedal box, especially when the clutch pedal is depressed. My plan was to use the existing clutch hole in the firewall to mount the WRX pedal box as a complete item. This requires some careful measurement. One stud hole has to be drilled next to the booster, and a clamping plate has to be made for the other one next to the feedthrough (This is a simple setup of 2 thick washers). 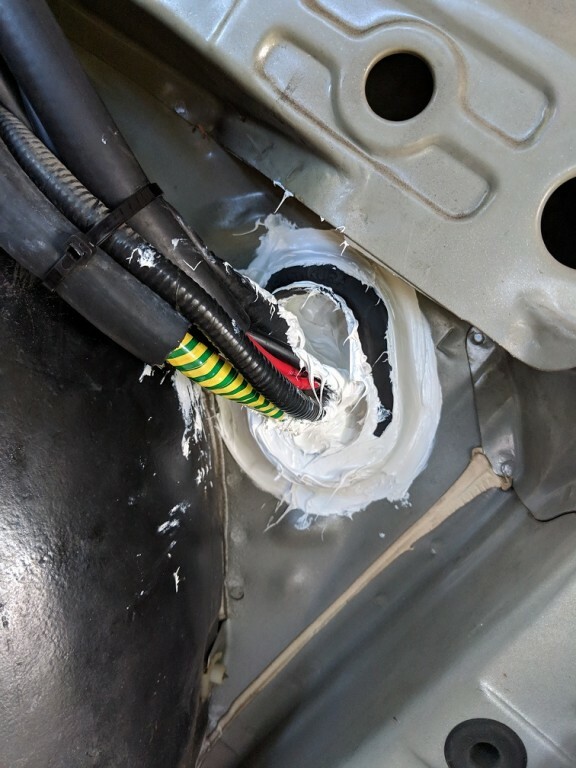 The major part of the job is the firewall cut in the spare wheel well. The spare wheel won't be going back into the engine bay (no room) so I wasn't concerned about loosing this space. I measured the required dimensions for the pedal box (with clutch pedal pressed), and cut a neat slot. Then, using a combination of the removed firewall, and some sheet metal, I fabricated a box to cover the slot. This was fully welded on all seams, then coated with a generous amount of seam sealer. 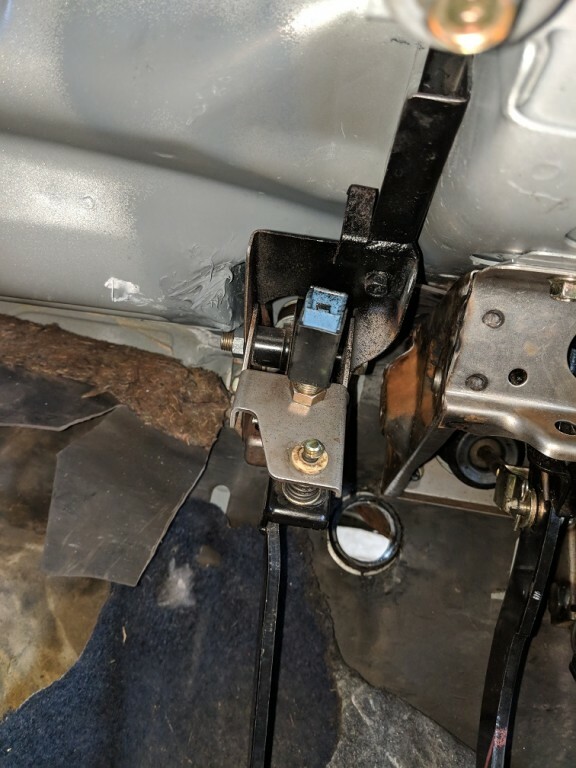 A bracket was fabricated to support the top of the pedal box, welded to the box, and bolted to the steering column mount. 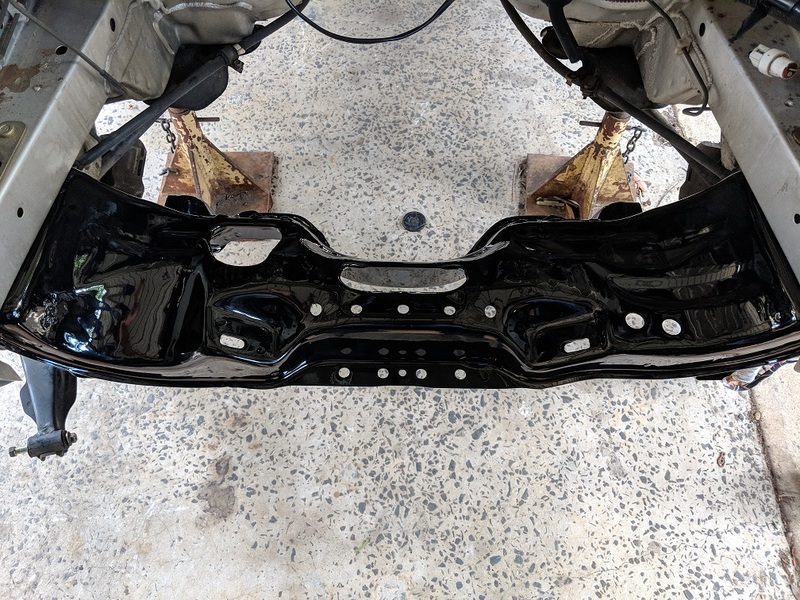 I then applied the required primer, base coat and clear to match the car. At this stage, the motor has to go in for a trial fit of the dump pipe clearance to the clutch master. I spent a lot of time simulating this with measurement, but the proof is always in the pudding. Plenty of clearance is evident, and the dump pipe will be wrapped, with the heat shield fitted. The clutch master will also be heat shielded, and the first part of the piping will be wrapped. 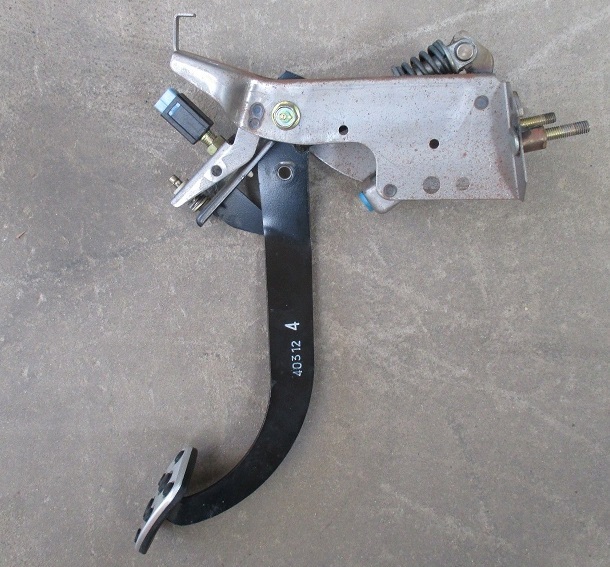 The original L-Series brake pedal was cut down, and the WRX pedal welded on, with the throttle pedal receiving the same treatment. The clutch pedal had to be cut down and re-aligned to suit the new placement (and to ensure full travel). In this picture, I'm still tweaking it to get it the way I want it, but you get the general idea. The heater in the L-Series has plastic tanks crimped to a copper core. Mine had started leaking some time ago, and was bypassed. As I had to take the dash out to do the clutch pedal and wiring loom, I decided to sort the heater issue. Apon removal, I discovered the plastic tank was cracked (no surprises there). Heat had broken down the plastic, and it had become brittle. After some ringing around, and a few fruitless visits to various shops, I finally found a place that had some NOS units with brass tanks! They had 2 available, so I grabbed one straight away. 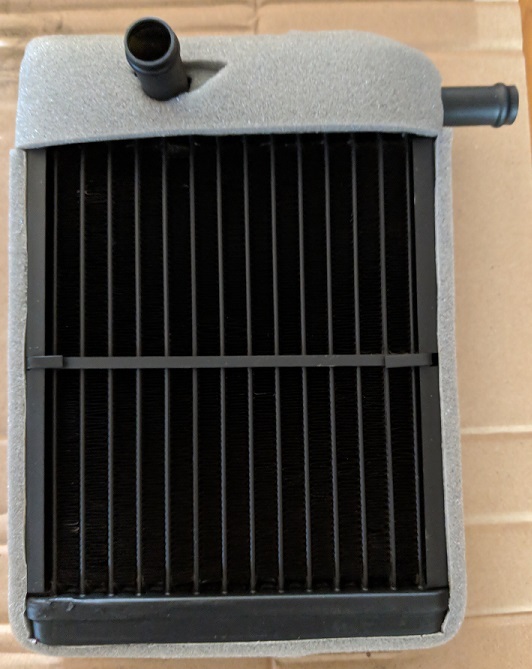 I will fit this into the heater box, but first I plan to strip the heater box and replace all the worn out foam tape that seals the various flaps and components. In keeping with the sleeper look I prefer, I wanted to run 4 x 140 steel rims. The original 13" pizza cutters aren't going to be up to the task, so I set about sourcing some 14" steel rims. I chose black, as it goes well with the car, and makes it look more stock. These are as close as you can get to the original Scorpion wheels, but are in a 14" x 6" size, and come with new chrome nuts. They will be shod with 195/70-R14, which makes them the same rolling radius as the original WRX, keeping the speedo accurate, and giving the car a chunky look. (I borrowed the pic from Google, as mine are still boxed up). 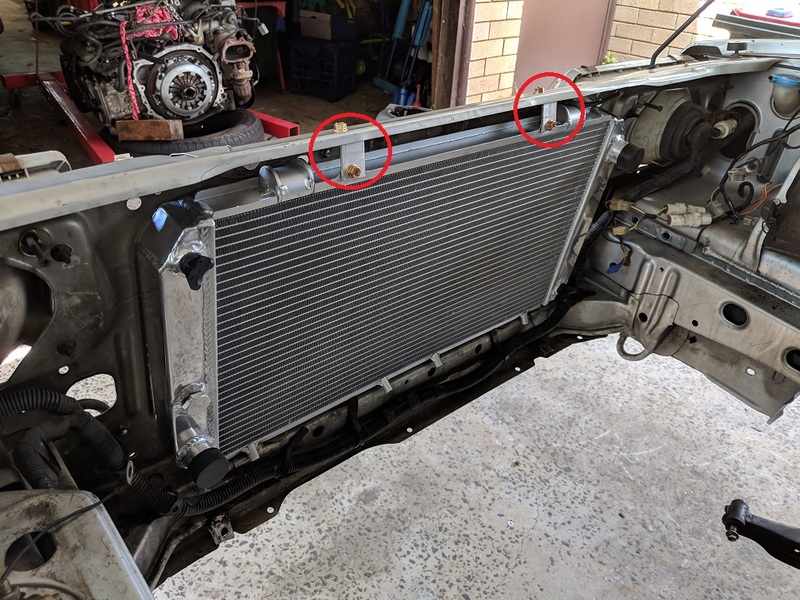 The L-Series radiator is not up to the task of cooling the EJ, and the tank fittings are the wrong size (30mm vs 40mm) and location. 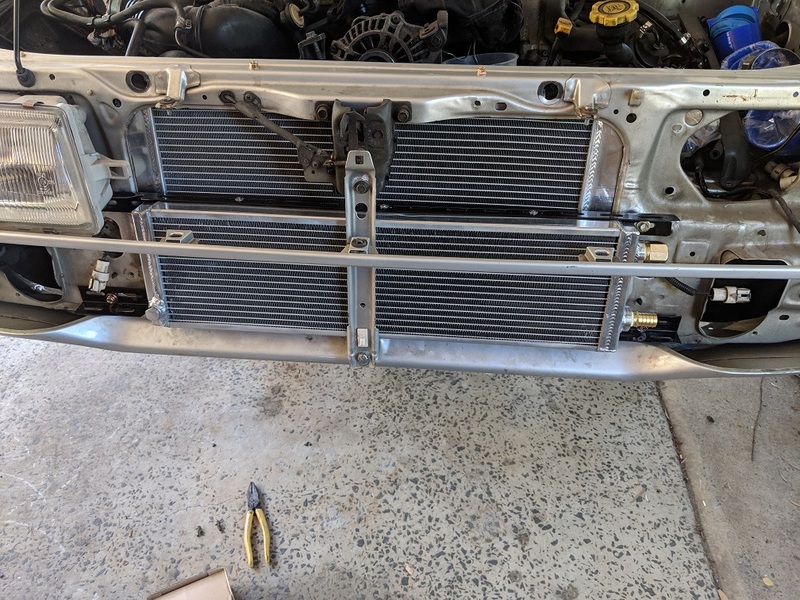 The WRX radiator is way too tall to fit in the engine bay, so another solution was required. I looked at getting a 2-row radiator built in the same style as the L-Series, using brass tanks, with different fittings. 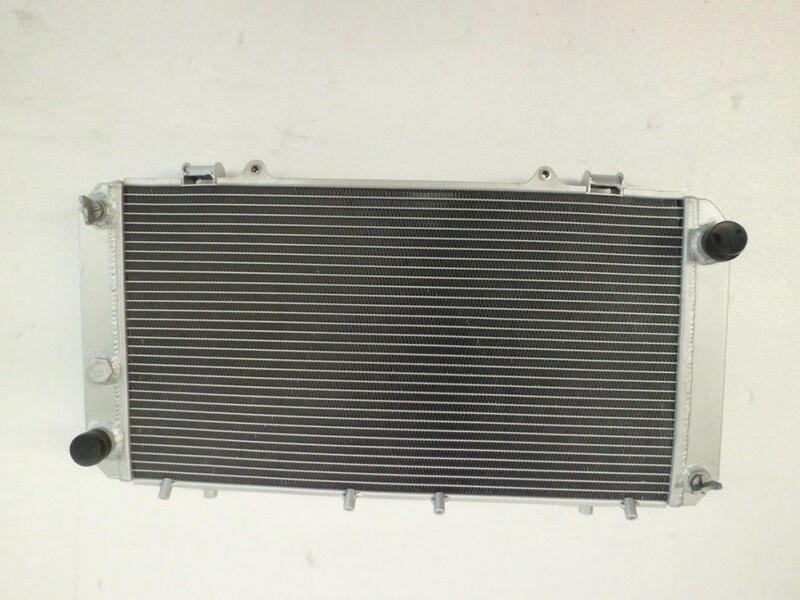 So, I hit the web, and found the perfect solution; an all alloy radiator to suit a 1989 Toyota MR2. It will need to have some mounts fabricated, and a couple of 12" Davies Craig thermo fans fitted, but it's the perfect size, with the right inlet and outlet orientation. There is probably a more elegant solution, but these are cheap and plentiful, in keeping with the ongoing serviceability of the vehicle. A you all know, the WRX runs a top mount intercooler, which requires a bonnet scoop. The existing scoop doesn't fit the L-Series bonnet, and I want more of a sleeper look anyways. There are plenty of front mount kits available for the WRX, so I found one in black, which will make it less obvious. A kit like this will make it a lot easier to fit. It will require a plumb-back BOV, because I'm not into the sound of an atmospheric (and they are illegal). This will be fitted in front of the apron, in a bumper cut-out. Haven't ironed out the finer details of this yet, but I will add to the post when I do. (Image borrowed from the eBay seller, as mine is still in the box). Having done a lot of the prep work, now it gets down to the fun part; actually getting the EJ to fit in there. The EJ20 turbo is a quad cam motor, with the "Spider" manifold. 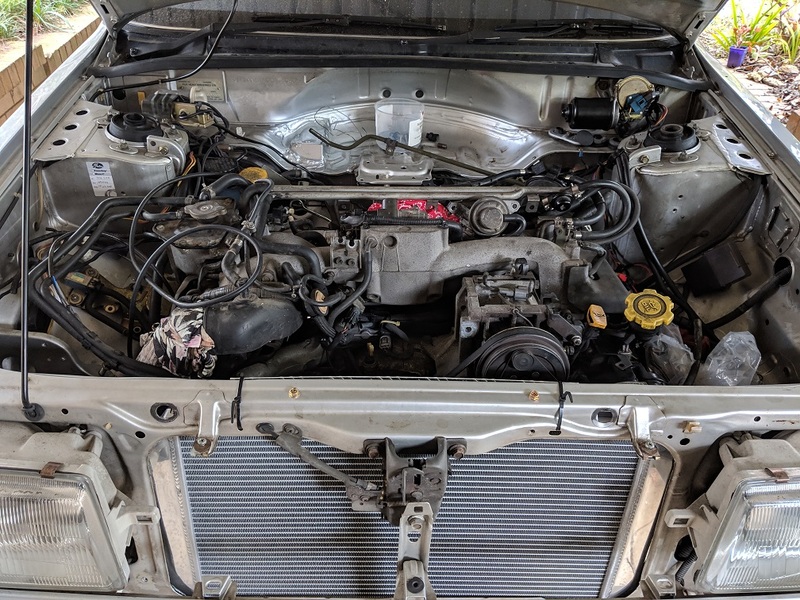 Despite what people will tell you, the EJ25 turbo won't fit in there, unless you cut the rails, which introduces approval issues. The EJ22 turbo will just fit, but it fails the "finger-gap" clearance, which I set for my projects (plus it's a bit of an orphan motor). 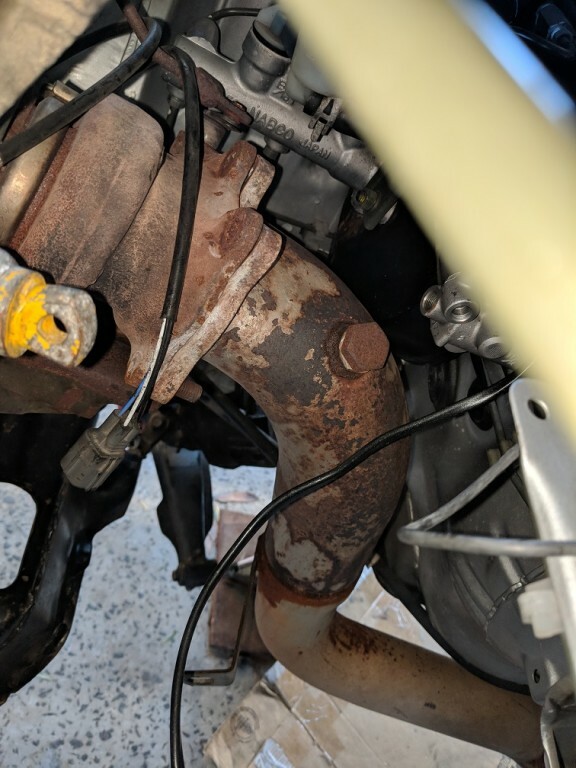 The up-pipe (I'm running a catless) fouls the original L-Series engine crossmember, but Mr. Subaru was a kind man, and released the L-Series in a turbo, so there are crossmembers available with the stamped depression for the up-pipe. Now, I could modify the non-turbo one that I have, but I like to use original parts where possible. This sent me on a 3 month journey to find the unobtainium crossmember. There are plenty in the USA, but they are all LHD . I found a few people that said they have them, but couldn't come up with the goods. 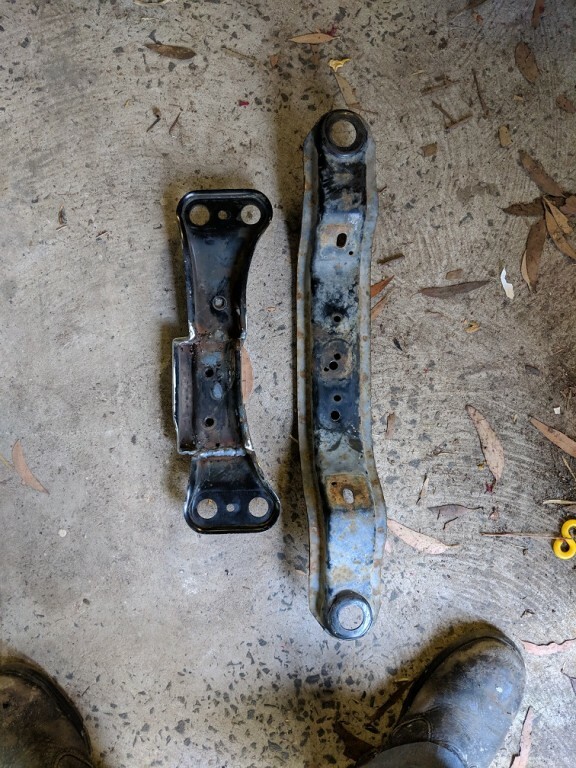 I rang EVERY Subaru wrecker, parts place, workshop that I could think of. It got to the point where I just decided to go ahead and modify my one, so I posted a request for a picture, so I could make it look as OEM as possible. A forum member kindly obliged. Note the scalloped depression next to the engine mount and steering. After some monumental stuffing around with couriers (don't ask), I finally had it in my hands. I had to slot the engine mount holes slightly, but that's it. As you can see, the up-pipe is a perfect fit. The crossmember will now be pulled out and sent to the powder-coaters for sandblasting and gloss black powder. The engine is a nice fit, and is now back out for cleaning, and the rectification of some broken vacuum fittings, etc. I'm wondering how you'll get the L series all disc brakes passed a brake test with that turbo engine? 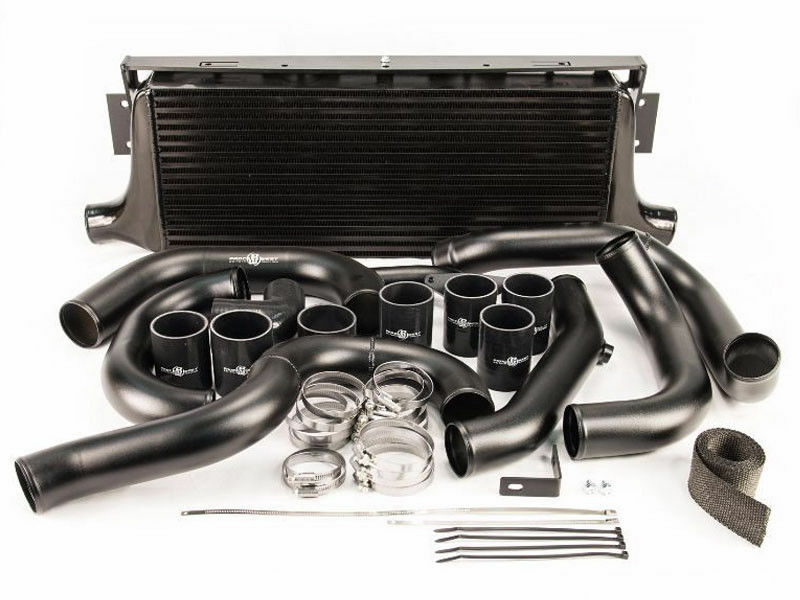 With the intercooler, did you consider the RS turbo WAIC setup? Or will you be tweeting the performance of the engine and require better intercooling than the WAIC can provide? Very nice, keep up the good work (and engineering). I've seen a wagon passed with drums and an EJ20G, so I'm hoping there won't be issues. IMHO, it's the suspension that is the limiting factor on these, especially the rear, so I don't feel the brakes will factor. I may give it a remap later, so the FMIC gives me options. 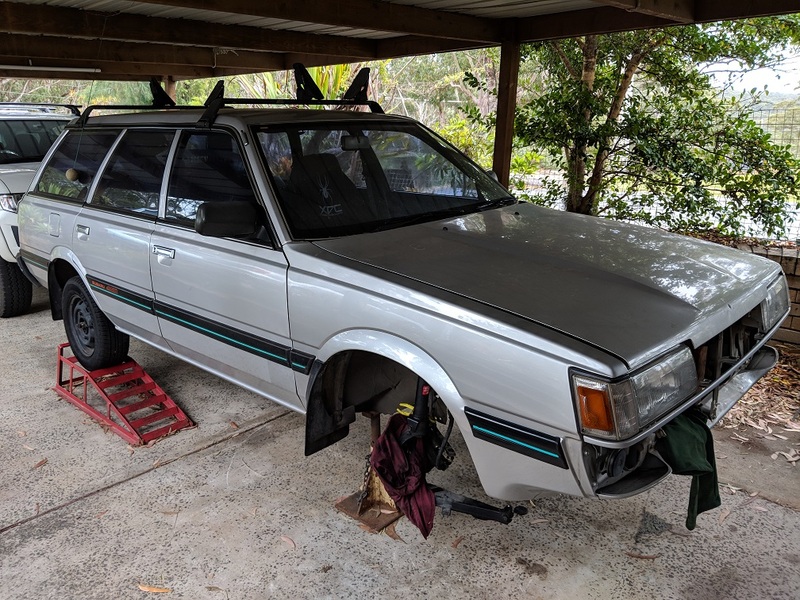 2) The car was already factory "turbo"
My whole brake setup comes from a factory turbo Loyale GL-10 Wagon from the USA, so I will be pinning my hopes on that. In all honesty, I have got cars through engineering that have proportionally less braking power than what this car will have, so I can't see them objecting. I do wish that it was as easy to get stuff through in NSW as it is in WA. @L-Rex - can you explain what you did to the diff? 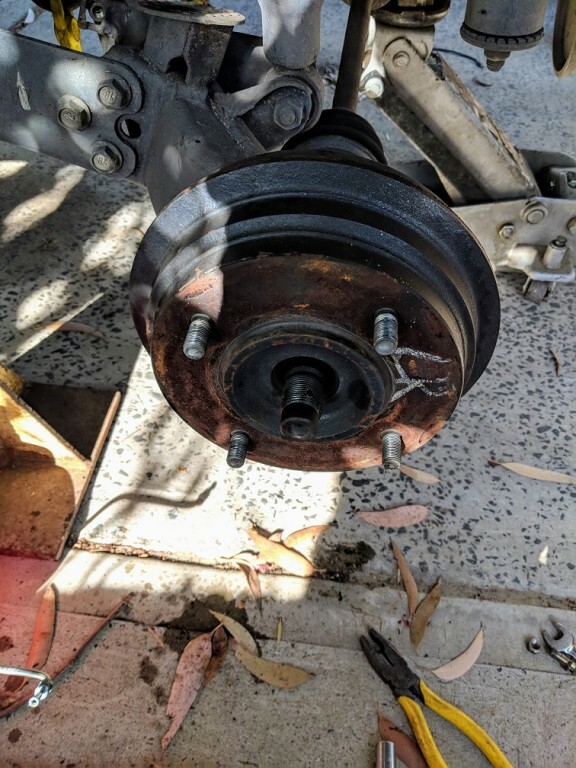 I'm guessing you swapped out the diff centre to use the factory L diff stubs. Correct? El_Freddo wrote: @L-Rex - can you explain what you did to the diff? Basically, it's a WRX diff, with the tophat out of the L-Series. I fitted the WRX crownwheel on to the L-series tophat. This allows the use of the L-Series stubs, which in turn permits me to run standard L-Series CV joints. Ah so you call the diff centre the top hat - the bit with all the spider gears in it. The first thing I'm going to suggest is to redo the brake lines for the rear. You've attached a hardline to a movable part (the caliper). The original line fitted to the backing plate of the drum which was fixed. It's not much of a movement, but over time that will flex and fatigue. Do you want your brake lines failing? BTW, you're welcome for the engine bay pic. That bay has had an EJ20T sitting on that crossmember in the past with no clearance issues. Also, if you want t think about doing a brake upgrade, you can now change the rear calipers to Honda versions. I've got mid 90s Integra calipers bolted into the Subaru carriers on the original discs. 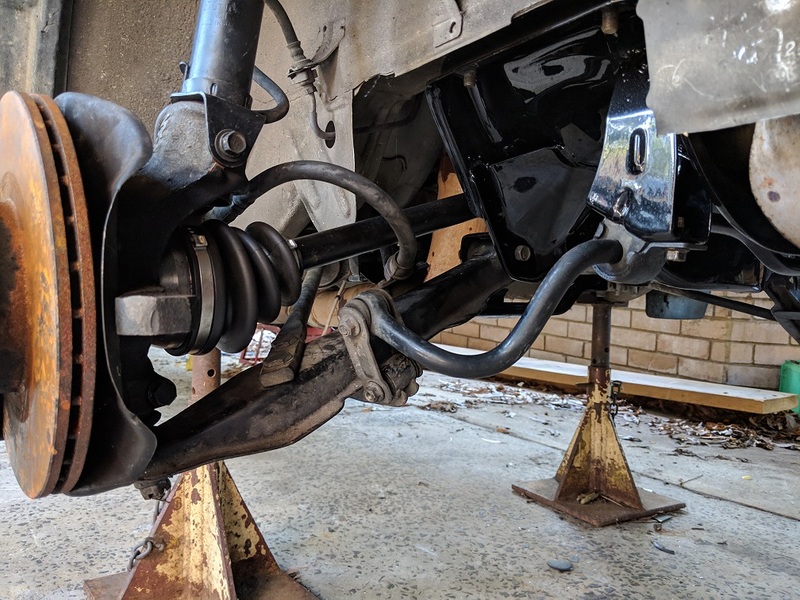 You need to muck around with handbrake cables, but means the front end is much more open to doing a larger conversion as you can change the calipers. wagonist wrote: The first thing I'm going to suggest is to redo the brake lines for the rear. You've attached a hardline to a movable part (the caliper). The original line fitted to the backing plate of the drum which was fixed. It's not much of a movement, but over time that will flex and fatigue. Do you want your brake lines failing? I was actually thinking about redoing the hard line with a pigtail in it. Currently looking at getting some short braided lines made. Yes, unfortunately I didn't find anywhere that had the correct rear trailing arms. 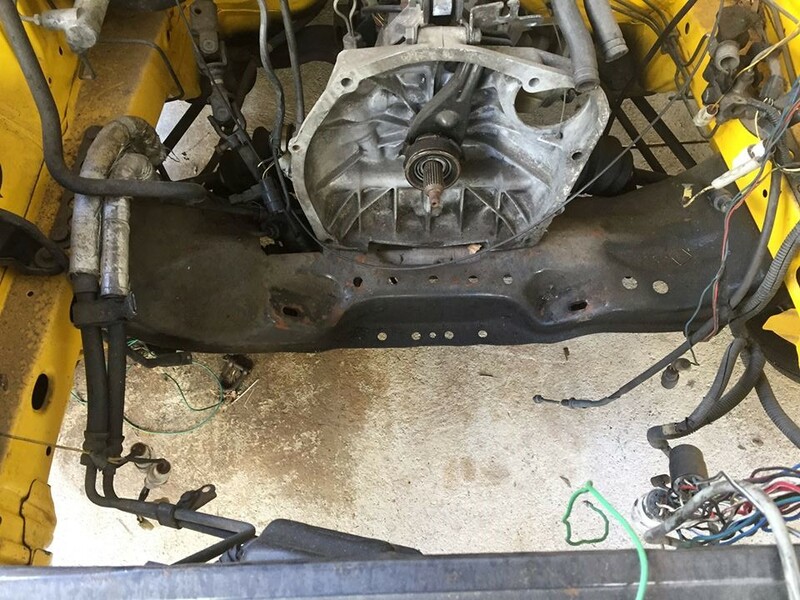 I will have to fabricate some brackets and weld them on..
wagonist wrote: BTW, you're welcome for the engine bay pic. That bay has had an EJ20T sitting on that crossmember in the past with no clearance issues. That pic would have saved the day if I had gone down the path of modifying the crossmember. It's a good reference pic. Are you still running the car with the turbo? wagonist wrote: Also, if you want to think about doing a brake upgrade, you can now change the rear calipers to Honda versions. 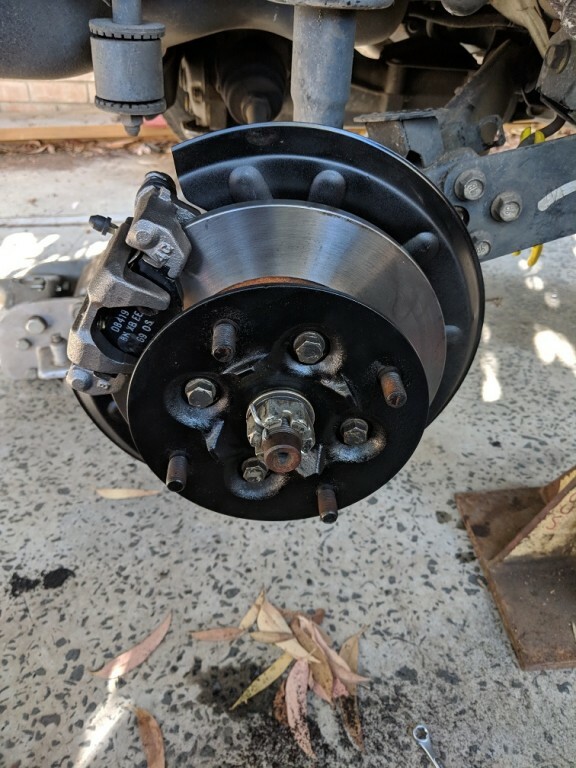 I've got mid 90s Integra calipers bolted into the Subaru carriers on the original discs. 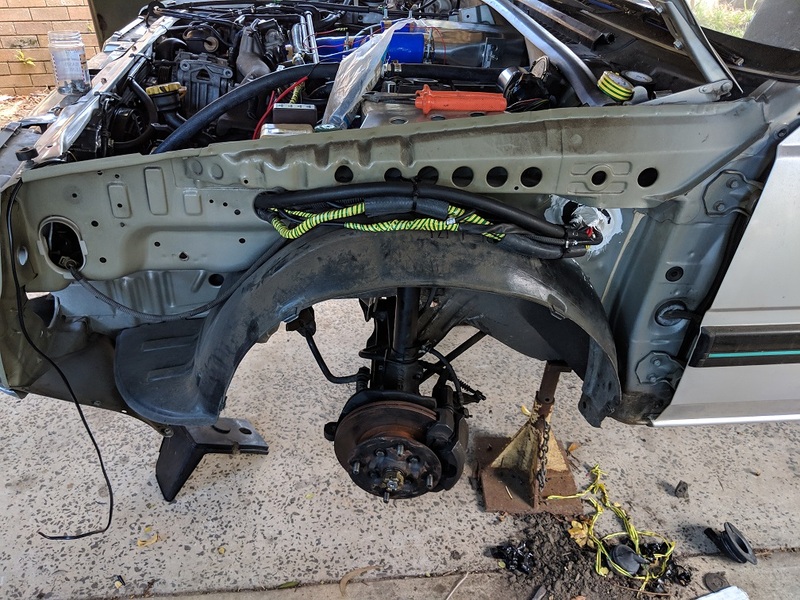 You need to muck around with handbrake cables, but means the front end is much more open to doing a larger conversion as you can change the calipers. Cheers, I might look into this. It may be possible to use the entire hand brake assembly of the Honda, and make a custom mount on the tunnel. Certainly food for thought. I'm sure this wagon will see ongoing development over the years. 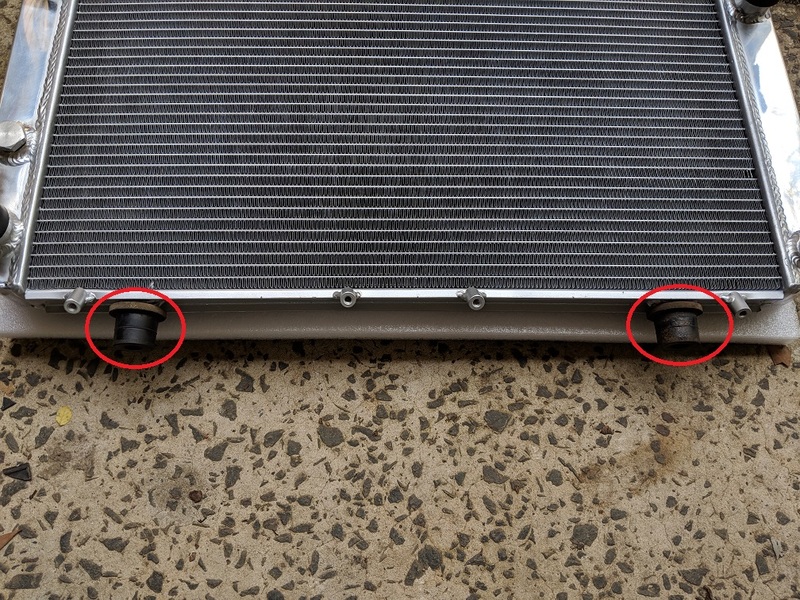 Top mounts are stainless angle, with a rubber bush isolating between the mount and the radiator support panel. Easy to take the radiator in and out. Motor sits just as well as before, but is now sitting at the right angle, as per the gearbox. 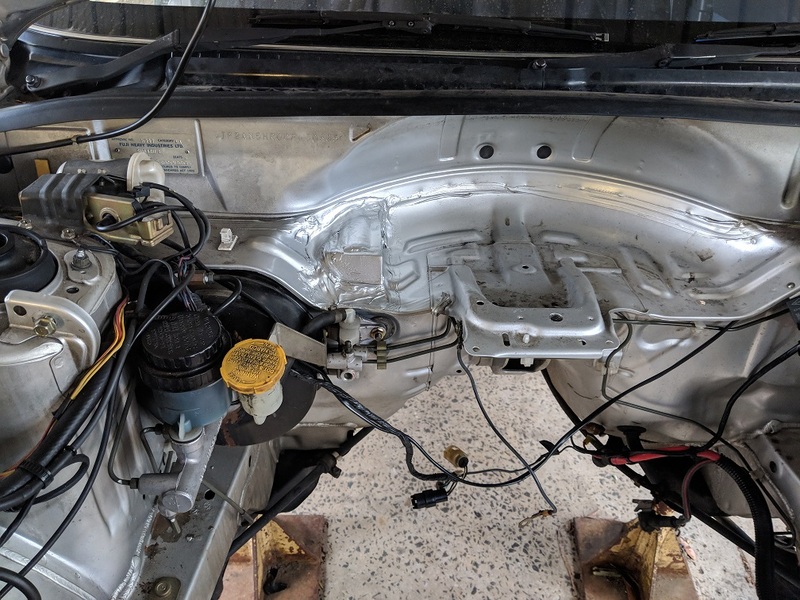 Still have to fabricate a front and rear mount for the gearbox, but this should be relatively straightforward, as I will modify the existing parts, using a combo of L and WRX. Gearshift setup will need to be shortened slightly, maintaining the original alignment of the rod! 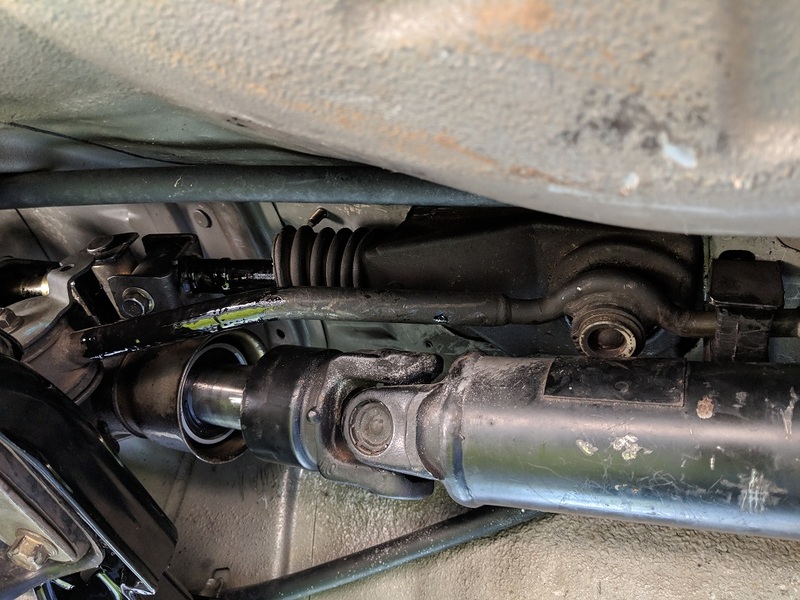 Driveshafts will be a combo of WRX inners, on L outers. 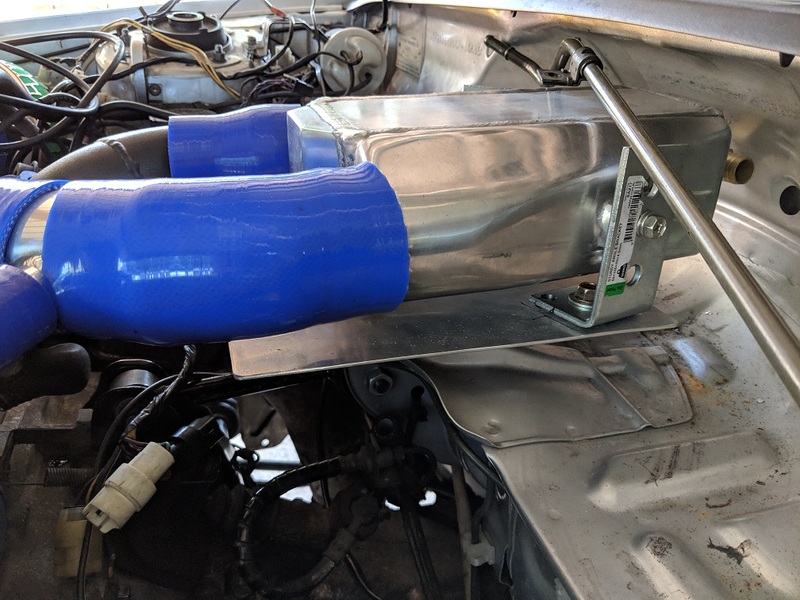 What needed to be modified on the chassis rail to fit the EJ25 turbo? I thought all EJ turbo engines fitted in the L series without any issues?? 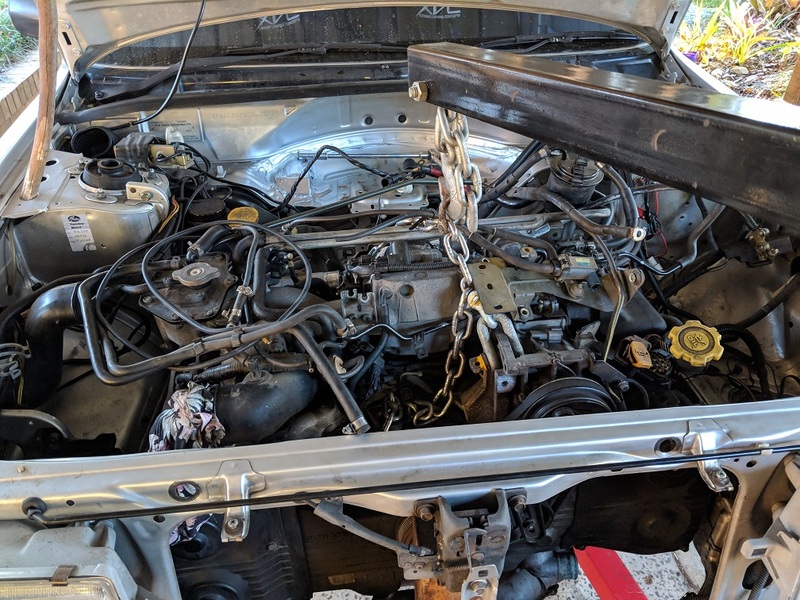 Anything up to EJ22 will fit, but (going off my measurements) an EJ25 won't fit without rail mods. 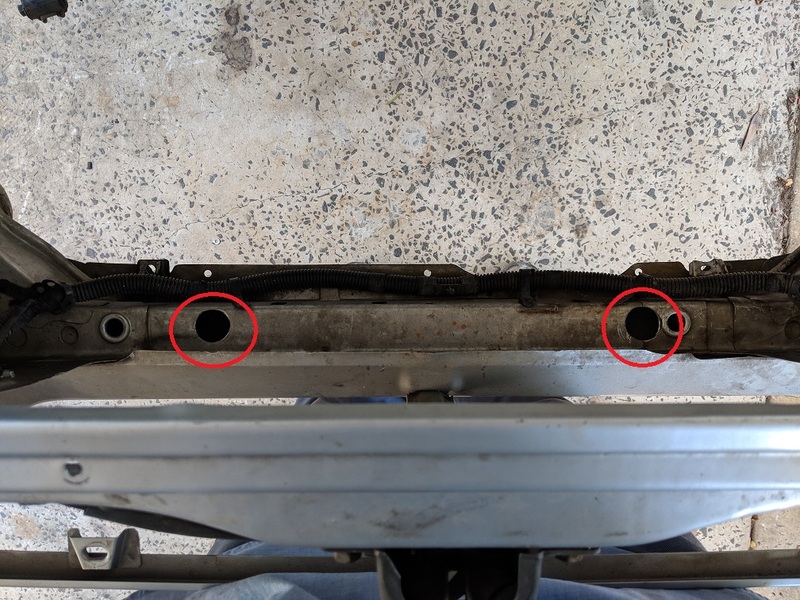 Yeah, I looked at the Pulsar, but in the end I decided to not go with a filler neck, as the header tank on the engine becomes the highest point of the system. The MR2 is a great fit, and the all-alloy units are cheap enough. Got a fair bit done over the last 2 weeks, the major part being the mounting cradle for the gearbox. As I have a selection of parts available, I decided to go with a modified manual front crossmember, a modified rear automatic crossmember, and the EJ centre mount. 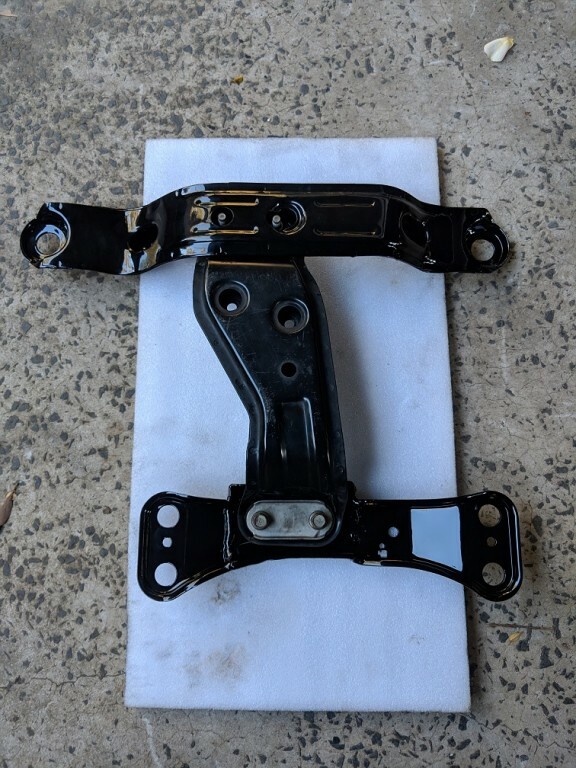 The manual front crossmember only requires 2 holes drilled to suit the front of the EJ centre mount, plus appropriately sized access holes, to allow a socket to fit in there. 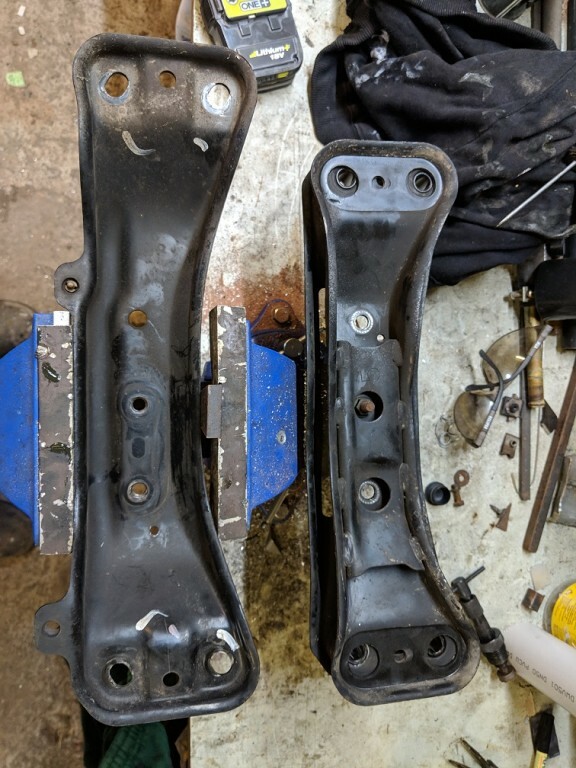 The rear crossmember from the auto was a bit more involved, the below pic is an EJ rear (left) and the 2-piece EA auto (right). I cut the mounting section out of the EJ, and grafted it into the lower part of the EA. The top section of the EA was completely cut down, so all that remained were the 2 stubs that hold the rubber isolation blocks. 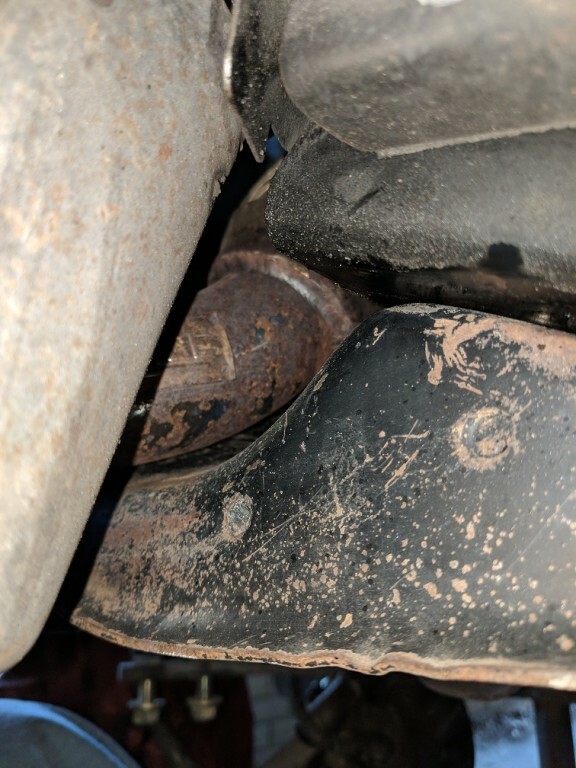 Clearance is a big issue in this area, so there was a lot of measuring grinding and welding. Here is the finished front and rear mounts, ready to go for powdercoating. 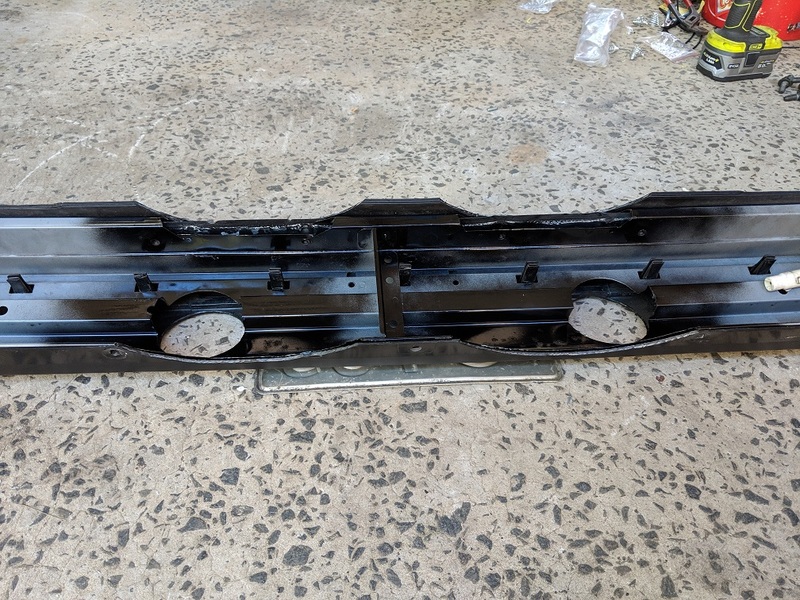 The finished cradle, assembled for fitting (it looks like there is a big cut-out on the RHS of the rear mount, this is just an artifact that popped up when resizing the pic. Probably from the shiny powdercoat). 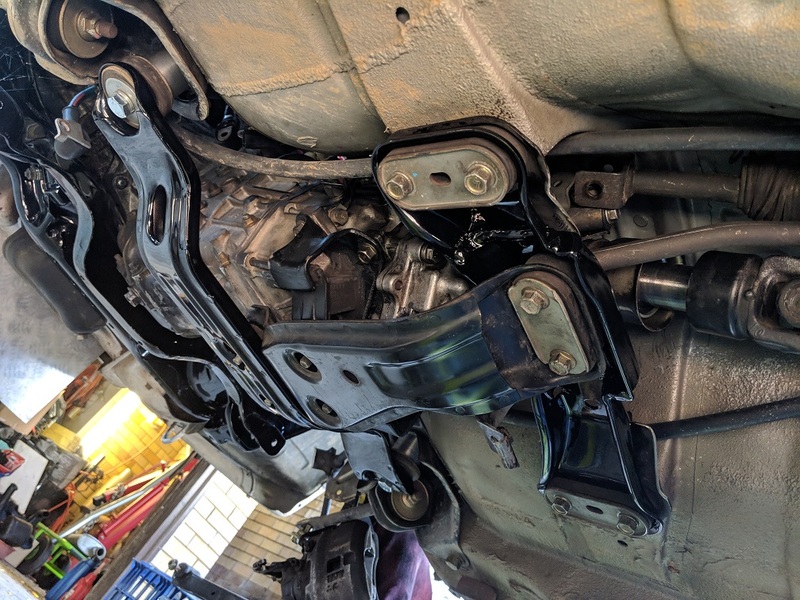 The front crossmember requires spacing down from the floorpan, so I machined up some spacers, and bought a couple of longer, high-tensile bolts to fit them up. To keep the rubber isolation mounts working, I flipped them so that the large cup washer mounts on the spacer. The next trick was the gearshift linkage and mounting rod. These are too long to fit the EA, and require shortening. The mounting rod mounts in a rubber block, which I trimmed down, flipped over, and mounted to the EA tunnel. I'm not 100% happy with this setup, and will probably end up making a custom mount for this. There isn't much clearance in this area, and millimetres count. The gearshift rods need to be shortened by 25mm. Don't forget to include the thickness of the cutoff wheel when doing your calculation! Before cutting, scribe a line down the length of the shaft to ensure that the orientation doesn't change when you weld them back together. As you can also see in this picture, the front section of tailshaft need to be lengthened. The rear section remains at standard length. This is the tailshaft from an automatic EA, and I have a manual one sitting in a car which may be the correct length. Have to do some measuring before I commit to having this one modified. Started playing around with the shifter console. The manual one fits if you rotate it 180*, but has the potential to pop the box out of second gear. 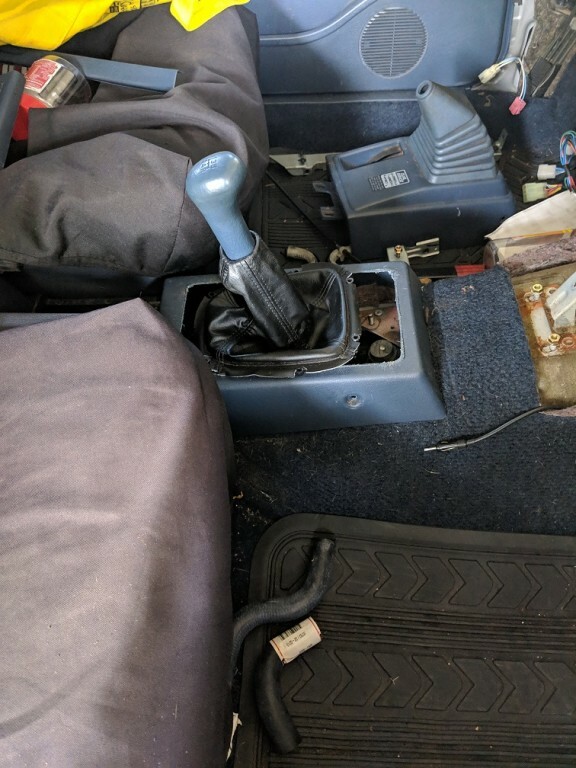 I ended up trimming down an auto console, and will make up a plate to fit the shifter boot onto. Interestingly, I was concerned that the gearshift was going to be too low, however, the EA gear knob screws onto the selector, and brings it to the perfect height. It even fits into the EJ vinyl boot! I am constantly surprised how much stuff fits between the models. The manual tail shaft front piece will be too long IIRC. You'll need the front section of your L series tailshaft shortened by about 70mm at a tailshaft specialist workshop. If you can afford it, recommend getting the uni joints all replaced with proper greasable ones. The last one I had done, they basically made me an entire brand new tailshaft and only kept the centre bearing. My uni joints are now Holden ones. The same ones this place uses for tailshaft they make in drag racing applications. There are some pics of it in my Monsterwagon 2.0 build thread. Great work on the gearbox crossmembers, that's pretty much exactly how I did my last one, but you spent more time making it look a lot nicer! I've neveer seen anyone use 3 factory pieces for the gearbox crossmember. Looks really neat! Cheers. It took a fair bit of measuring, tacking and trial fitting, but I was pretty happy with the result. I've never seen anyone use 3 factory pieces for the gearbox crossmember. Looks really neat! Cheers, I like to use as much of the factory gear as possible. Plus, powdercoat makes everything look nice. Shortened up the pitch rod, it's just the L one cut down, and fits the WRX gearbox. Then I started setting up the WAIC, having decided that the FMIC was going to be way too difficult to fit. 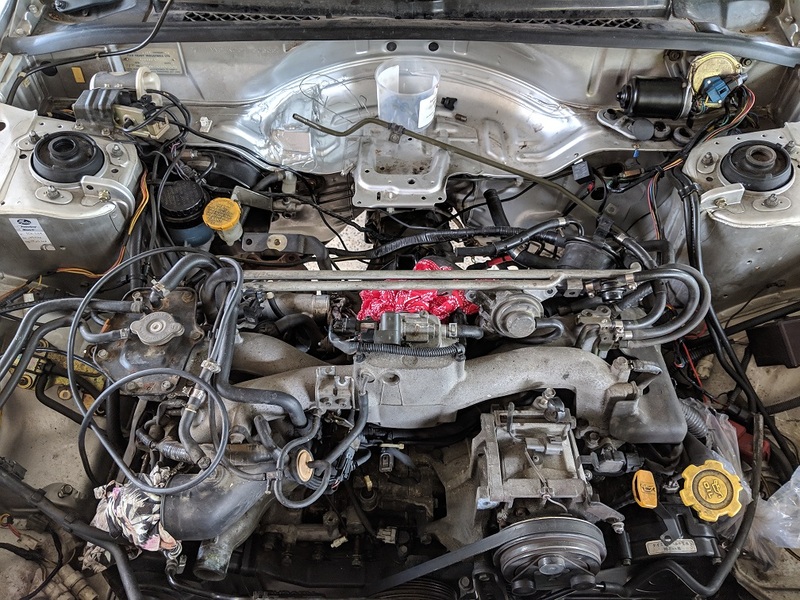 This WAIC is nice and compact, and is good for 300hp (significantly more than rest of the car will take ) Got all the hoses cut down to where I need them, now I just need to make a mounting bracket, and plumb it all up. The heat exchanger mounts neatly in the front, and will have two 7" thermo fans fitted. I just need to play around with the water fittings, run the hoses, and trim up/paint the brackets. With the intercooler, those two black dots in the spare wheel well are mounting points for the bracket that the space saver spare sits on. They could be a good mount point for the cooler, unless you want the cooler to move with the engine. I can’t remember and didn’t pick it up with a quick scan of previous threads while typing this, but are you keeping the AC? I hope my future project is half as neat as this! You read my mind Bennie! I'm going to pick up from those mounting points, and the front mount hole for the normal spare wheel screw. The engine won't be moving that much, given how solid the trans mount and the pitch rod are. I really wanted to keep the A/C, but at the moment, I'm absolutely at the limit of space for even the necessities. I will probably revisit this at a later date, as I have a couple of ideas about where to run the condenser. I kept all of the wiring associated with the A/C intact. 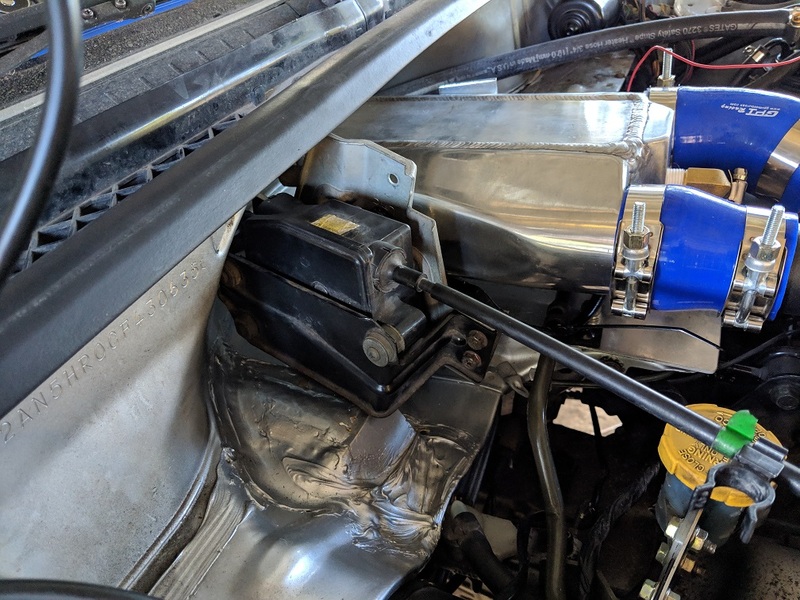 It's the same with the power steer, If I had gone for the GC8 instead of the BugEye, the power steer reservoir sits on the engine, and the air intake matches up with the factory MPFI air box (I have to modify the air box for this setup). Plus, there would have not been an immobiliser to contend with. But, I got a reasonable deal on the donor car and I specifically wanted the 3.9 gearing and this cruise control setup. I’m about to fill out the paperwork to start my first engineering experience on my build. More to come on that in my build thread once I know the path I need to take for a successful, certified modification. PS: what’s that line Tee’d in above the throttle body, between the TB and the WAIC? I've been pretty busy at work, but have started to get the rest of the driveline back together. D/S front CV in and suspension bolted in. More time has been spent on wiring, but not really a photo moment Rebuilt heater box and dash still has to go back in, but that will be after I run the loom and ECU through. I've got a couple of days off coming to me (hopefully), and I plan to get the surge tank, fuel pump, etc. plumbed in. I also hope to get the WAIC plumbing sorted, am waiting on a couple of elbows to finish the parts list. Also need to mount thermo fans for the radiator and WAIC heat exchanger. Got the thermo fans fitted, I'm running a Davies Craig 12" slimline on the D/S, and a 10" Davies Craig standard on the P/S. Should provide decent cooling. They look a lot closer to the pulley than they actually are. I started to mock up the fan position for the WAIC heat exchanger. These fans will run constantly, so will provide a boost to the radiator as well. 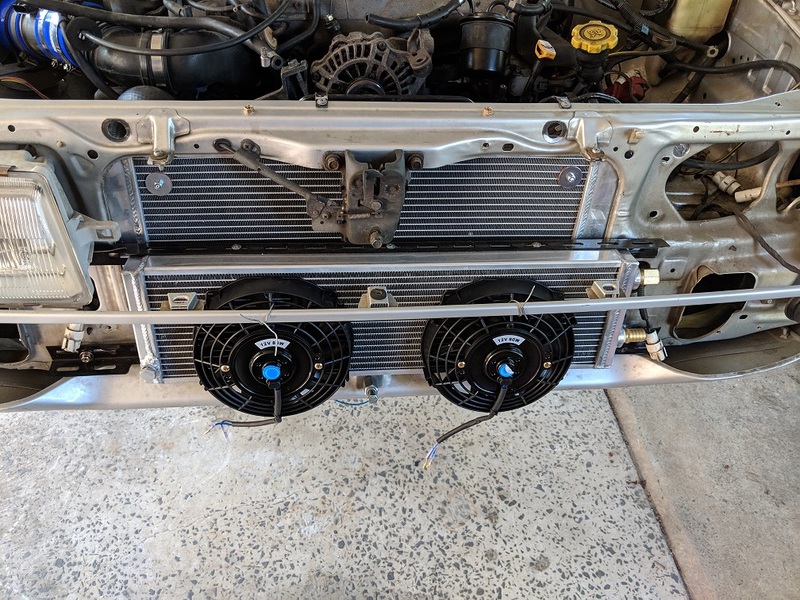 These were the smallest "push" type fans that I could get, but they will require deflection plates on the bottom, and some significant mods to the front bumper. I have almost finished the bumper mods, and will detail that in the next post. (They fans are just held on with a bit of wire to mock up). Made up a proper mounting plate for the WAIC, it picks up the spare wheel bolt, and a couple of other nutserts that I fitted. Sits there rock-solid! Couple of zinc plated brackets from Bunnings that I still have to cut down and paint. Pod filter fitted. 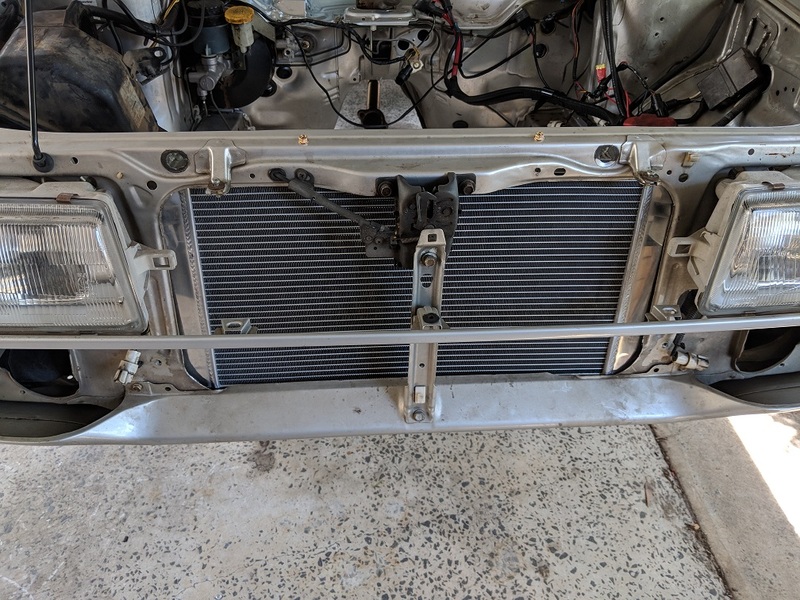 I had been modifying a stock metal airbox for this purpose, but I ended up destroying the top section by backing over it with my ute I will have to make a cover for this section to make it legal, and then track down another airbox lid. At least this will get it running and engineered. Got the fuel surge tank fitted. This was probably one of the more challenging items to find room for. The engine bay is getting cramped! I'm going to use the evap line as the return line, but just have to trace it back under the rear wheel arch to check where it actually goes. LOL. Last time I did one of these it had a fuel injected model fuel tank, which had a decent return line, not the tiny carby one. 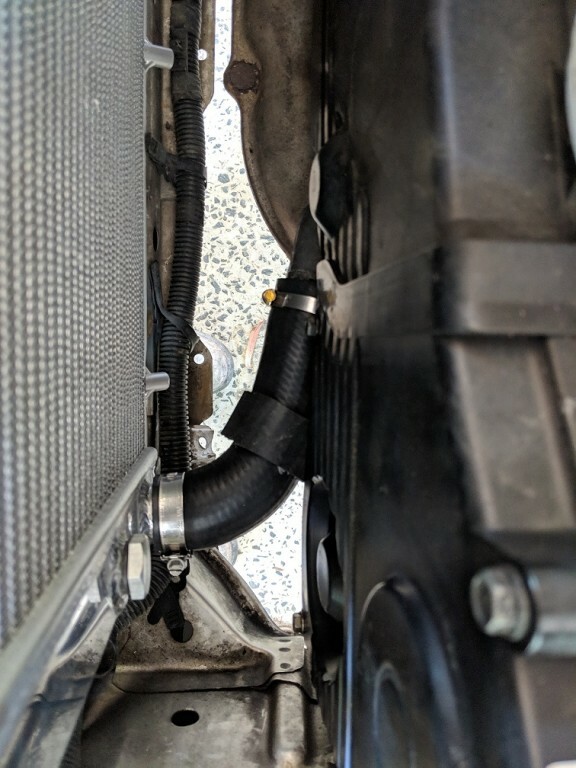 Wasn't happy with the clutch master reservoir position relative to the exhaust heat shield, so I knocked up a little bracket to get it away from the heat. Sits in the cutout where the WRX had it positioned. Hopefully get more done next week! Got the tacho dash wired in. Bit of stuffing around with power, grounds and the 2 high beam wires, but everything works ok. Still have to test the tacho function when the engine is running. 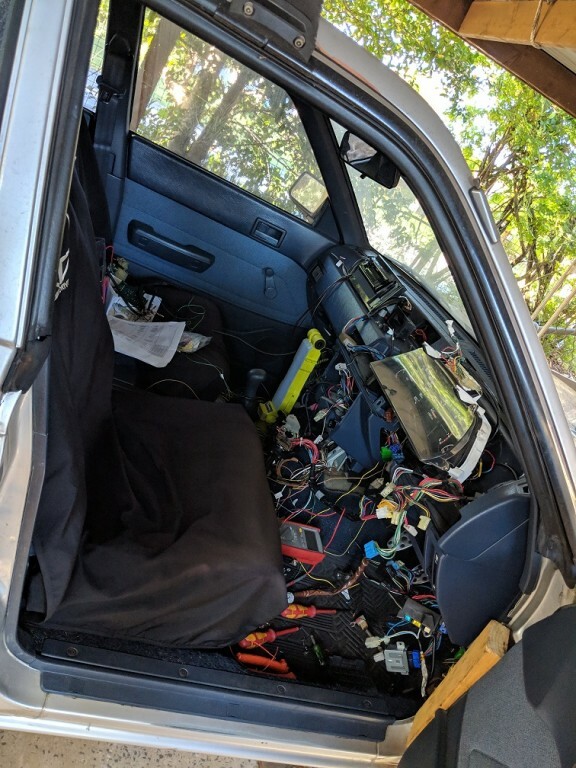 So hang on, are you wiring the wrx loom into the L series from front to rear? Or are you splicing in the EJ loom over the L series loom like a “standard” conversion? Classic! Just like the first time you hit the Parker light switch on top of the steering column! I'm splicing the tach dash into the L non-tach loom, and then the WRX loom into the L, as is normally done. Ran all the cables through the L cable gland, and used a crapload of white Sikaflex to ensure that they stay there, and no water gets in. Ran all the cables along the inner guard, just like OEM. Had to extend the wiring for the cruise control, trailer flex offered the perfect solution in the one cable. Cruise control unit mounts up next to the WAIC. 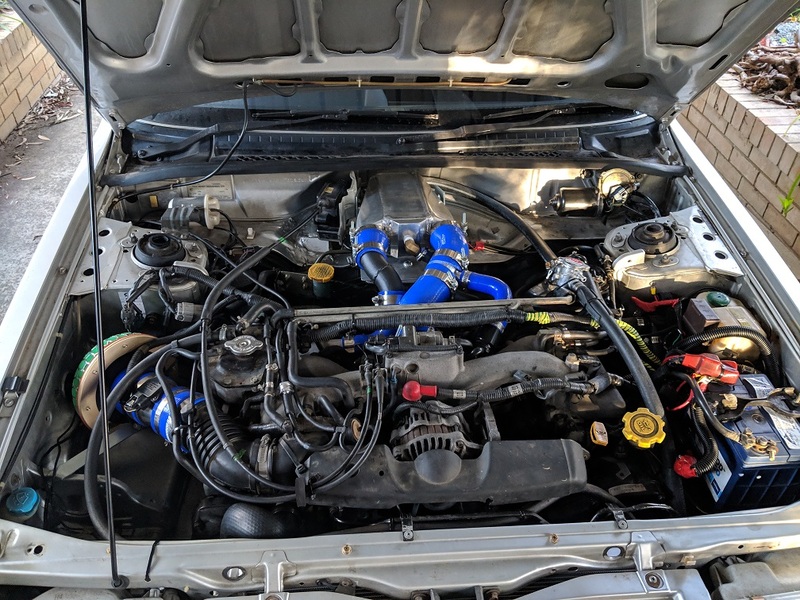 Engine bay fully completed. Ran a check valve in the vacuum supply to the vent controls to prevent boost pressure getting into the system. Used the L charcoal canister vent line as the return line, and repurposed the tiny carby return line as the vent. 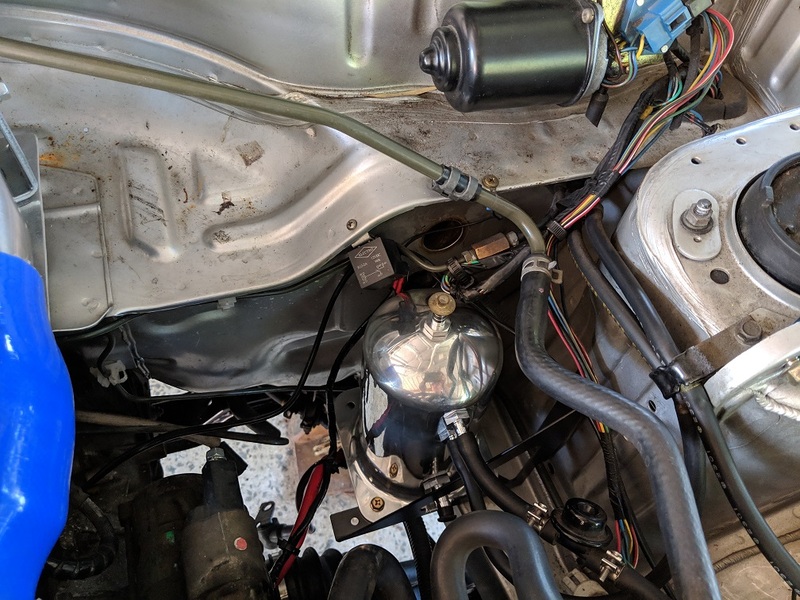 I used the original carby fuel pump to supply the surge tank, with a check valve to prevent head pressure against the pump from the fuel return. Bosch 040 is the main pump, regulated by the WRX fuel controller. I forgot to remove the pressure regulator from the L pump output, so that's a project to complete over the next few days. Bumper cutouts for the WAIC cooling system. They are set up to run all the time, and the WAIC remains quite cold to touch. Very happy with this result. Still have detail stuff to finish; I'm trying to source a factory L console for the manual gearshift. The reverse lights are not yet connected, and The aforementioned VSS wiring. Still have to integrate the cruise control switches, but I have misplaced the master switch somewhere in the garage. Exhaust is just dumping near the diff at the moment, with a dodgy extension pointing it down. It's fairly quiet, but I need to sort that out ASAP. Speedo reads 10kph quicker than actual speed, but the new 14" wheels/tyres will sort that out (probably 185/70 or 75-14). The tailshaft is a modified L, fitted with a GTR rear flange to suit the WRX diff flange. This also gives me a replaceable uni in the rear. The ecu earth switches the thermo fans so you’re on the right track there. With my little EJ22 conversion I found ample space around the steering column for the ECU, factory power and fuel pump relays. My fuse panel that connects the EJ harness to the L’s loom is mounted behind the glovebox. And the aftermarket immobiliser is tucked up high well out of the way in the event that I flood the car (again - it was close last time!). I'll be sorting out the fan relay setup today, possibly the VSS wiring, and my new AFM should arrive on Monday. Then I can get the exhaust done. Wouldn’t suspect a thing looking at that L.
The flywheel was occasionally touching the dust cover, because it was sitting slightly on the crossmember. Spaced it up by 6mm with some stainless steel shims. 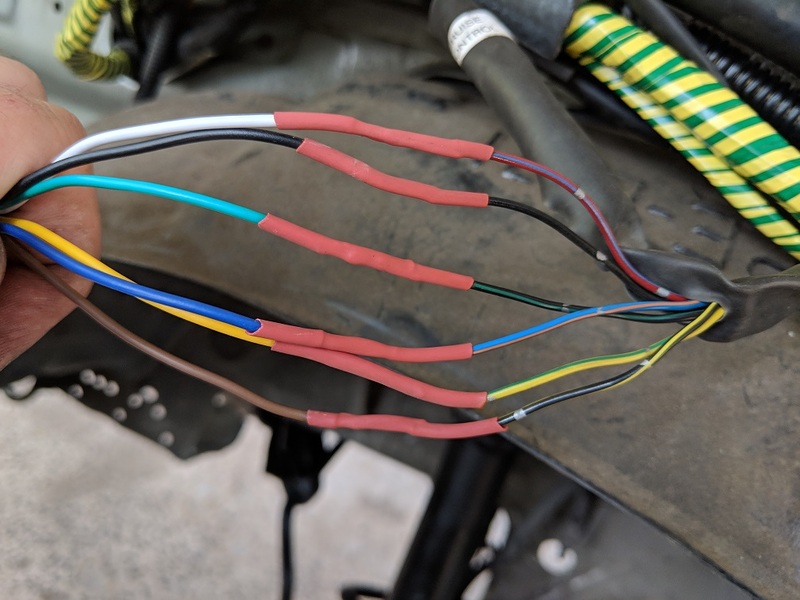 The VSS wire from the L speedo has now been connected for the ECU and cruise control. 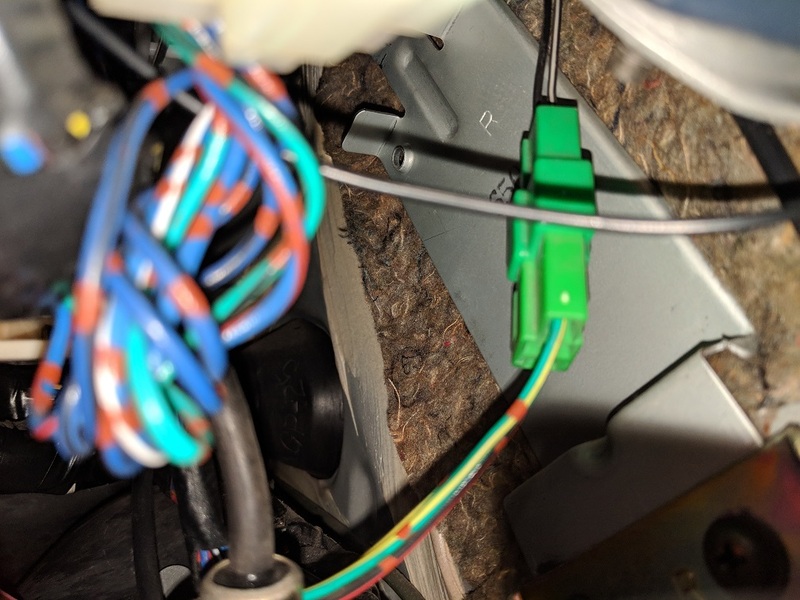 It connects to the green/yellow wire on the loom plug to the speed sensor (not to the small separate loom for the sensor itself. I left the speed sensor connected for the ground and the data link wire, and it just tucks up under the dash. 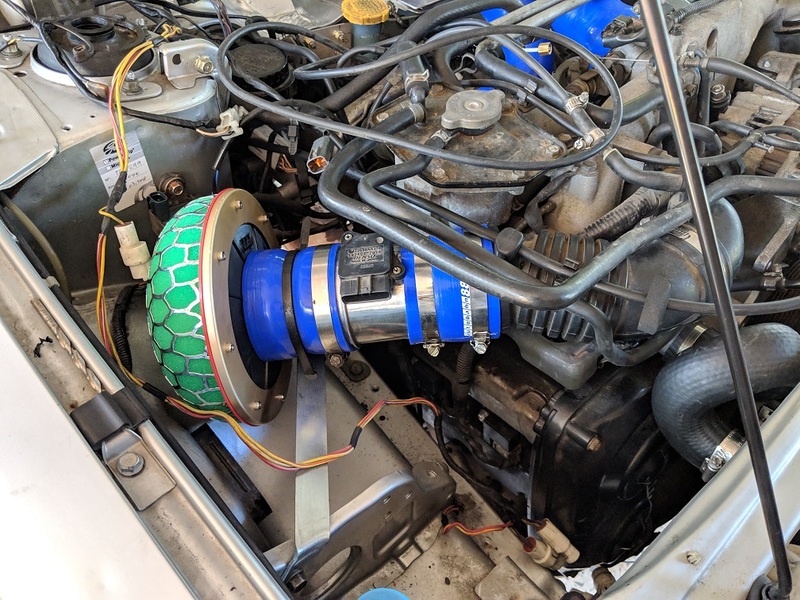 The VSS wiring led to an interesting discovery; if the speed sensor is not connected, the ECU throws code P500, and sets the fans to run constantly. This was the issue that I was having with the fans not working as I expected. I need to buy another relay, which will allow me to wire the fans to run of the ECU trigger. Was having some top end misfiring, which I suspected was the usual AFM issue that WRX's get. Turns out that the speed sensor disconnected puts the car into limp mode. Also had a bung O2 sensor on the pre-cat pipe, which will also cause limp mode (codeP0031). Fixed both those issues. Surge tank kept running out of fuel. I had previously heard the the L electric pump running for a short period, so I thought that it was fine. After going through the wiring, I discovered the L has an engine revolution sensor, which takes a signal from the coil and uses this to run the fuel pump. It's up above the bonnet release, on this bracket, above where it has "R" stamped. I have already removed it for this pic. You need to jump the Black/Red wire on the plug to the Blue/Red wire. The locations on the revolution sensor relay are shown, but obviously you jump the pins on the plug. Then throw the relay into the bin, it does nothing else in this setup. This allows the L pump to run continuously, as soon as you turn on the ignition. No more fuel starvation! Fit the rear section of the exhaust. 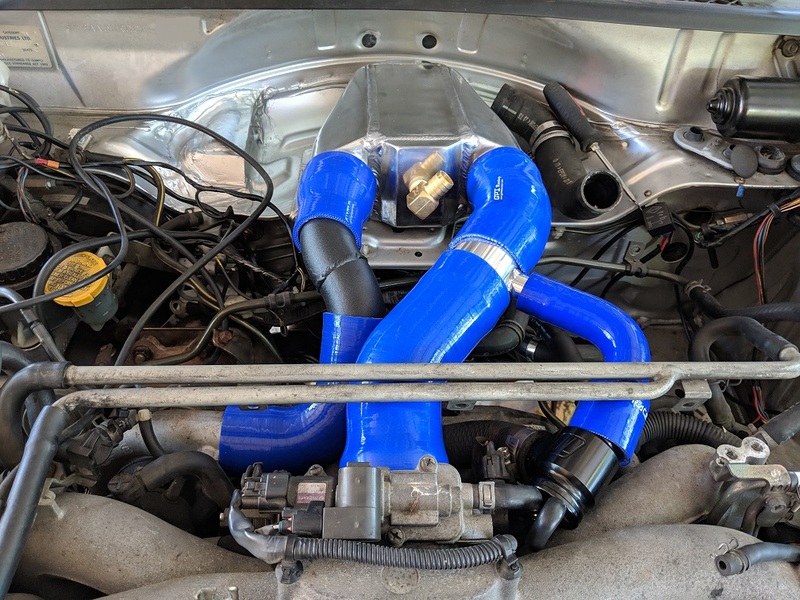 I was going to do this myself, but I decided to book it in to a muffler place instead, as I'm a bit time-poor at the moment, and I really want to get this project finished. With the L series pump, you should be able to reference the tacho wire from the ecu to trigger the revolution relay. Then it will work as it should and happy days - plus it keeps the factory safety factor in your conversion. I would’ve thought a hard wired fuel pump that runs all the time would be a bust in a conversion. But I could be wrong too. Awesome stuff. Great diagnosis and problem solving. One thing I could suggest- is it possible to take a signal from e.g. 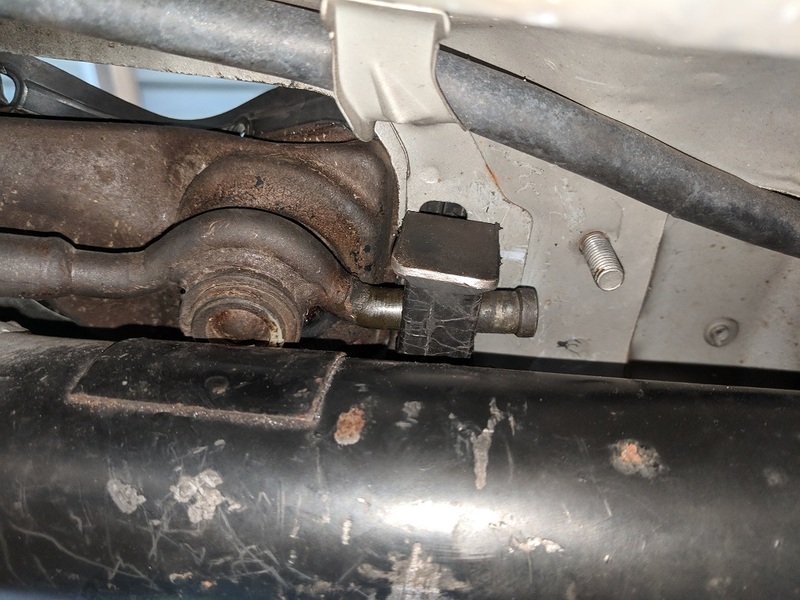 the crank angle sensor to that fuel relay you just removed? I suspect it's there to save you in a crash as it will stop the fuel pumping when the engine stops. I looked at using the tach for a signal to the relay, but it doesn't seem to be that straightforward. 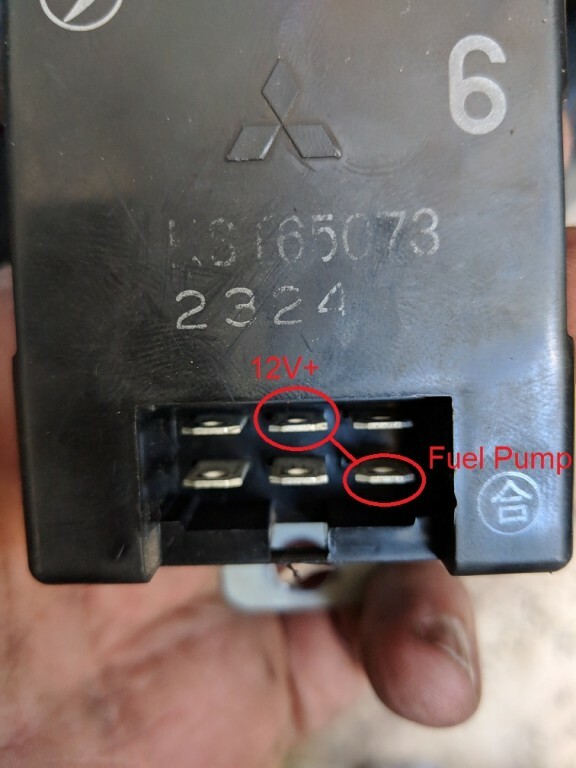 When I connected the tach output to the coil trigger on the relay, the pump doesn't work It could be that my relay is a dud, but I will pull one from another one of my cars, and check it out. The circuit inside is quite basic, so it might just be a dud resistor or similar. Reflecting on it during the evening, I also realised that I can possibly trigger the L pump from the WRX fuel pump controller, but as it runs a variable voltage, I just need to check the lower end of the scale to make sure it will latch a relay. Failing that, I also have the option to knock up a simple circuit to trigger it from the crank sensor. 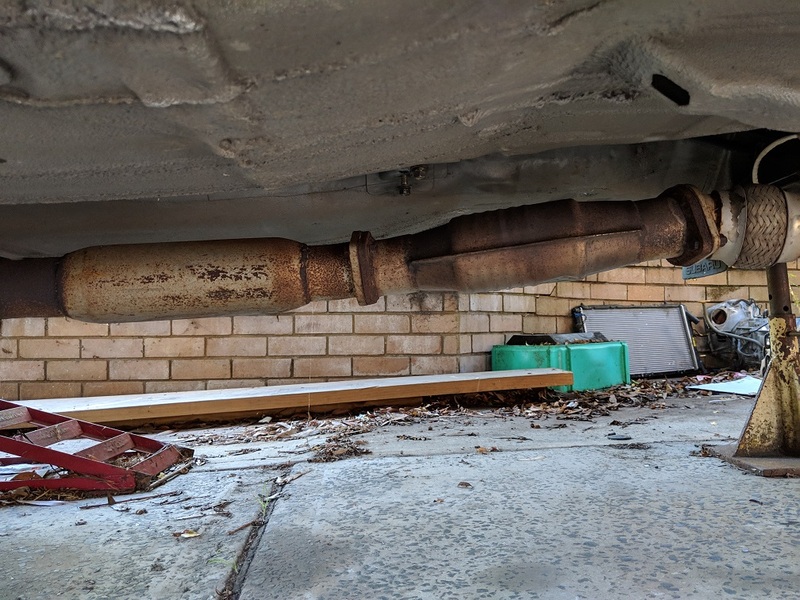 Exhaust rear section done today, the car is nice and quiet now, especially on the freeway. 3" stainless over the diff. 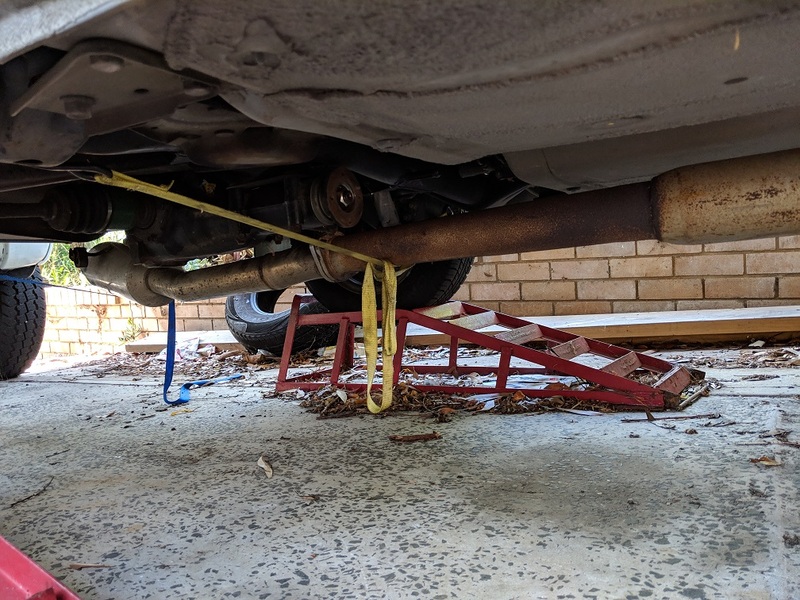 Took a bit of effort to fit a muffler and pipe up there, but it worked out (pics to follow). Took it for a good long run after the exhaust went on, with Torque monitoring all the engine vitals. The engine cooling fans are still set up to run permanently, at this stage, but the thermostat controls the temp well, settling on ~86* in traffic, and cooling down to ~80* on cruise. Interestingly, the fan switching is no straightforward deal. As we know, the ECU uses negative switching, however, the WRX twin fan setup also has a high and low setting. If the ECU isn't seeing a certain resistance value on the switched output, it goes into fault. 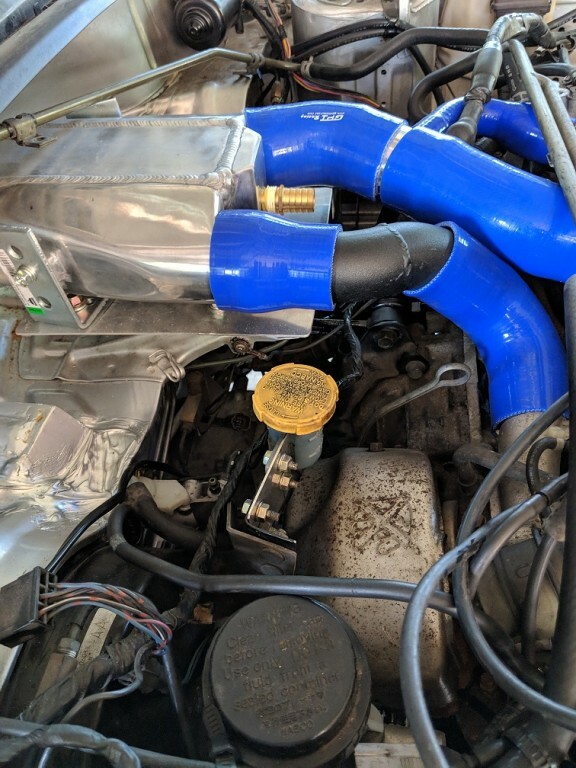 I sat down with the OEM fan to work it all out, and decided to just use the spare threaded port in the radiator inlet tank to run an thermo switch. I have a couple sitting around, and will select the most appropriate one and wire it into the existing fan relay setup. 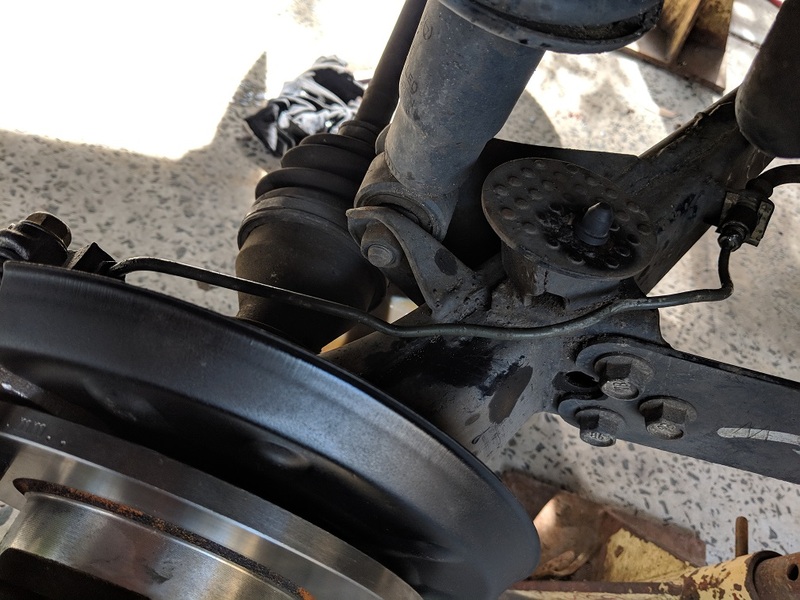 I also neglected to mention in the tailshaft mods, an automatic tailshaft needs the front section lengthened by 50mm - 55mm, and the centre bearing needs to be lowered by ~10mm to allow the shaft to safely clear the gearshift (not required if you have fitted a lift kit that uses gearbox spacers). Also not mentioned earlier, the hole that is used for the clutch master is the one that the speedo cable goes through. 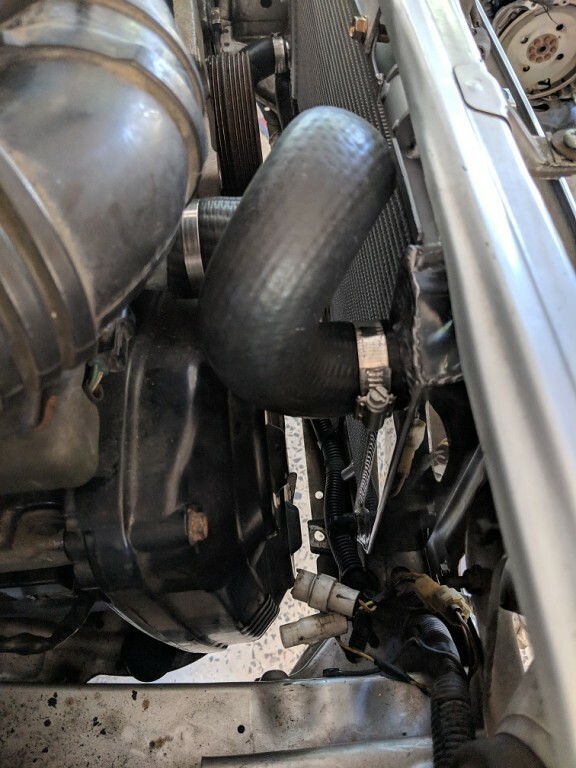 Since the speedo cable gets re-routed to clear the exhaust anyway, there is a convenient grommet lower down that does the trick. Made a centre console out of alloy chequerplate to get it through engineering (pics to follow). 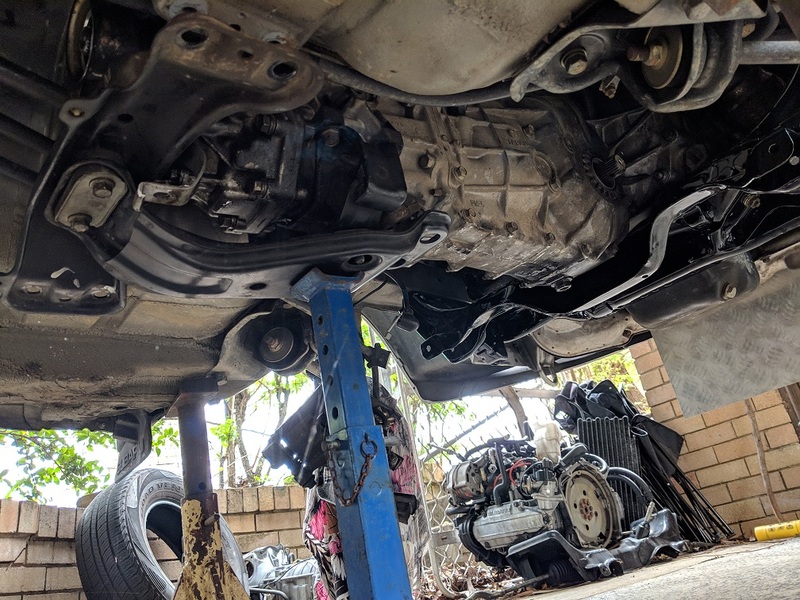 My next project will be a strut brace; you can now feel the flex when under hard acceleration However, the car feels really well balanced, and the difference between the FWD EA82 3 speed auto, and the 5 speed manual AWD, is simply awesome. In all honesty, this is the best one of these that I have built, probably because this one was for me It also strikes me that no matter how many times I do this, you still learn things along the way, and still find things to do better next time. 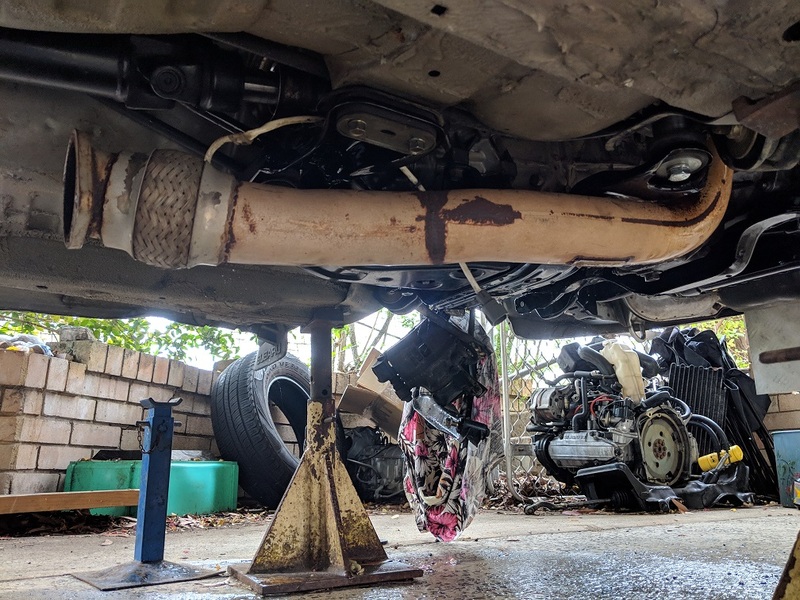 For those bold enough to undertake this job I kept a running tally of costs; For parts and external jobs like the tailshaft, the cost is somewhere between $11K - $12K, but this includes all new suspension, wheels, tyres, new heater core, and other "nice-to-have" things. Take away all that, and you're probably looking at ~$9K. 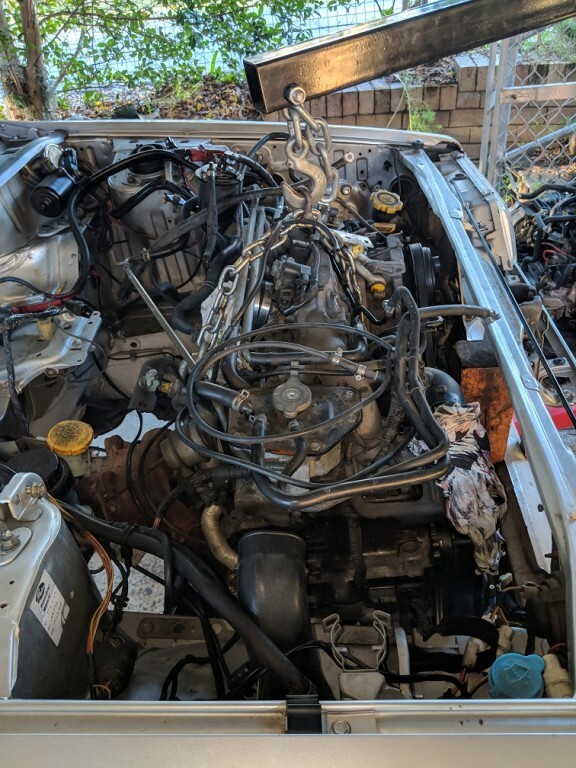 Don't bother trying to buy a separate motor and gearbox to fit, you will need a hell of a lot of stuff that can only come from a complete donor vehicle. Brackets, pedal box, hydraulics, wiring loom, electronic components, fasteners, mounts, etc. You would spend far more on individual parts. I would strongly suggest that if you are buying a donor vehicle BUY A PRE-BUGEYE DONOR . I went for the Bugeye this time, simply because I got the whole car for a very good price, but it did add some complexities; the air intake is better suited to this conversion on the GC8 WRX, as is the power steer, and the lack of an immobiliser. Everything has to be measured, designed, made, trial fitted, modified, tested, etc. Even a simple job like fully reconditioning the heater box, takes a lot of time. 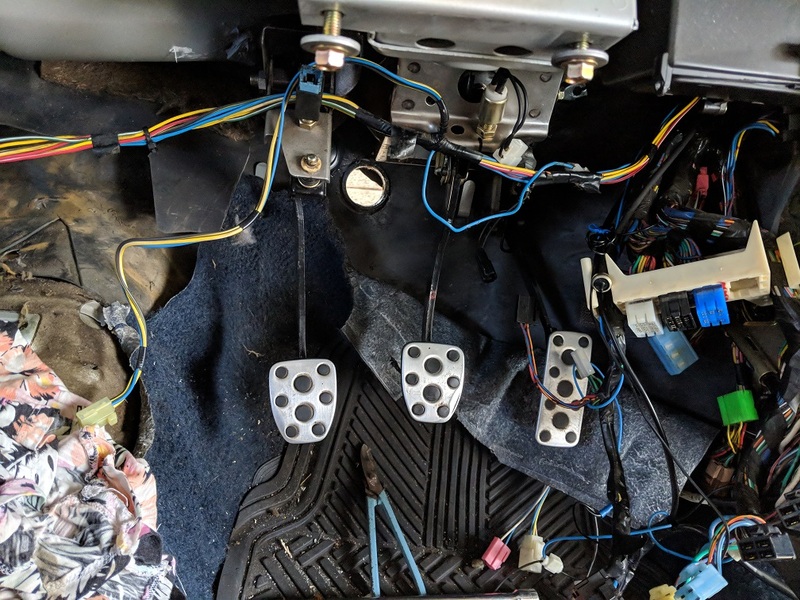 The wiring on this is not trivial (especially when also fitting a tach dash), and there is a lot more to consider than a standard EJ swap. There is still a gremlin on the dash conversion; the park brake lamp is either dull or bright, not off, and I went from having a functioning charge light to not. There is something backfeeding a voltage, or a partial ground that is causing an issue, so I'll be sitting down with the multimeter again There is also staggering amount of extra electronic stuff that is specific to the WRX, that you have to find space for, and sacrifices have to be made; no A/C being one of them.